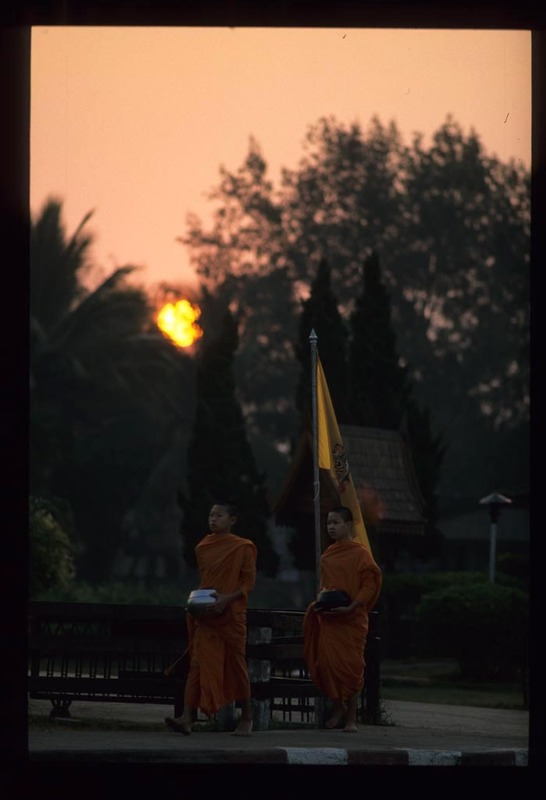 Just about the time this posts, we'll be in Phayao (pronounced Pah-Yow), capital of a northern Thai province of the same name. 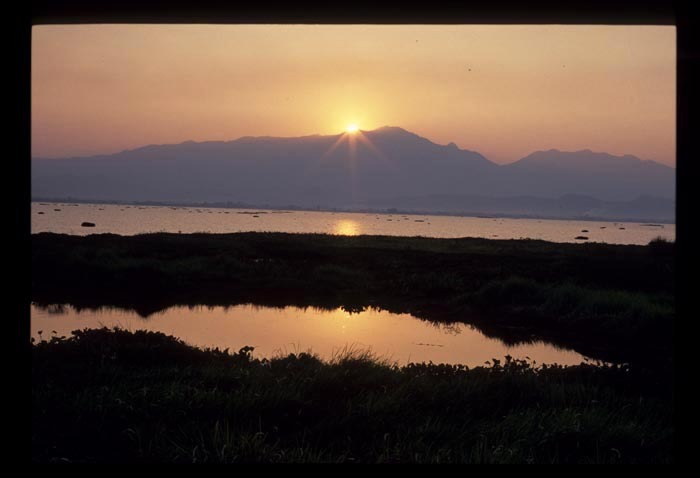 Phayao's claim to fame is it's huge, placid lake - also named Phayao - and the abundant, oversized goldfish-like fish that are pulled from it and served crusted with salt, then grilled over an open fire. 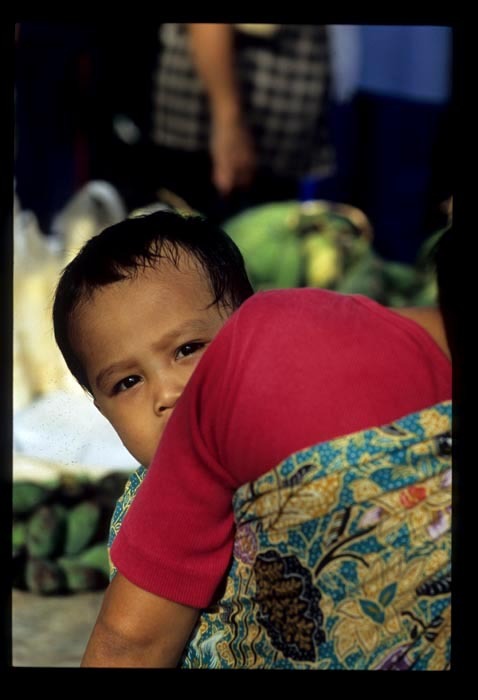 Phayao also boasts a large and interesting morning market, spread out over a maze of backstreets. But we're not here for any of that. We won't be staying the night, we won't be marketing in the morning. We're just passing through, on our way to Nan province, in Thailand's northeast. 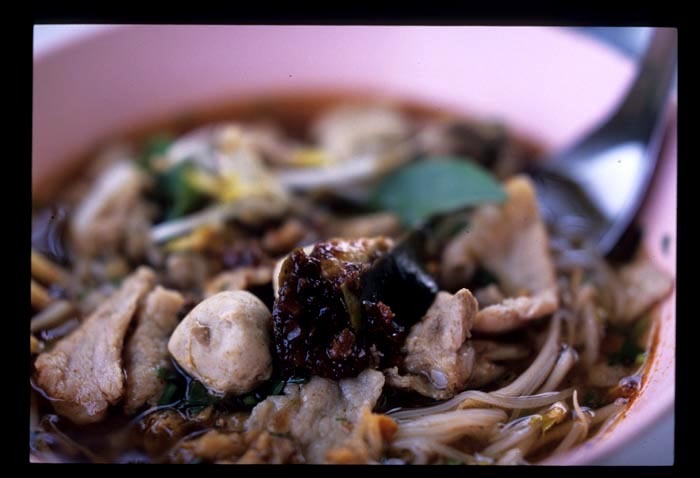 And we're just in time for lunch, a lunch we remember fondly from our first visit to Phayao last February. We're here in Phayao, after an easy 1 1/2-hour drive from Chiang Mai, solely for this: guaytiaow tomyam. Tomyam noodle - sold all over Thailand. Nothing special - unless it's sold in this town, in this shop, on this street, by this vendor. The shop fronts a little neat little wooden house on a sedate, tree-lined street of neat little wooden houses. It's shaded by a tiled roof and a forest of potted and hanging plants and marked by a flower-draped archway. It's spotless, shining, gleaming - so clean you could eat off the tables. The mark of a vendor who takes pride in her place, and pride in her product. The aromas wafting from the vendor's prep area promise so much ... and the noodles deliver. Piggy, not-too-bouncy pork balls, thin slices of tasty pork meat, a single pork rib so tender the meat falls off the bone in shreds at the slightest nudge, a shower of crispy pork cracklings. Sweet, aromatically herbal broth, sharpened with pieces of salty and sour pickled cabbage and nubs of caramelized garlic and its cooking oil. Customizable, of course - as all Thai noodle dishes are - via the use of the ubiquitous Thai tableside condiment trolly of fresh chilies in vinegar, roasted and ground chile peppers, sugar, and fish sauce. 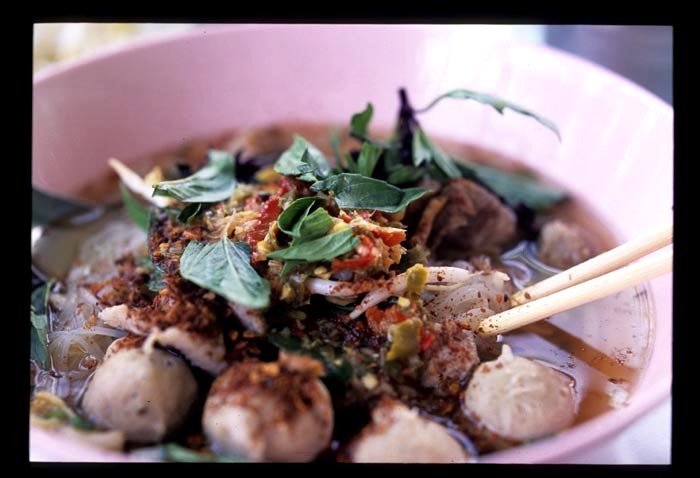 What really makes this bowl of tomyam noodle sing is the vendor's personal touch, a generous blob of homemade nam phrik. Chile sauce, but not just any chile sauce. I taste - and she confirms - lemongrass, galangal, basil, garlic, shallots, and dried chiles. She demurs when asked to reveal what else is in the mix. It's all ground to a course paste and cooked slowly, to a thick jam. It's fiery, sweet and sour at the same time, citrusy, deep and rich yet lilting and bright. It lifts a bowl of already memorable noodles to the ethereal. Yes, just about the time this posts we'll be here, eating that. And about 1/2 hour later we'll be back on the road, just another couple of happy customers. Tomyam noodle shop, Chom Thong Road, Phayao town, Phayao Province. Look for a green archway and a green and white signboard with the numbers '25' hanging over the sidewalk. Morning till late afternoon. When we were living in Shanghai in the mid-nineties, we watched as wet markets and the neighborhoods around them fell one after another to wrecking balls and bulldozers. As the city's traditional markets disappeared flourescent-lit Tops supermarkets sprouted on seemingly every other block. A Tops opened in our historical neighborhood of rowhouses about six months before we left the city. It was rarely busy; our neighbors (like us) preferred the fresher meat and produce proffered just a few blocks away at the small shichang (market), which was slated for demolition later in the year. I rue the day that cities in southeast Asia follow Shanghai's suit and eliminate all but a few wet markets in the name of 'modernization' and 'progress'. I shop at grocery stores in Kuala Lumpur, out of convenience. Every time I do I wish I'd found the time to go to a wet market instead. Supermarkets put me to sleep with their sterility, their predictability, their utter boring-ness. But they do good, at least in some places. In India, I was surprised to read, the opportunity to sell direct to supermarkets has helped some farmers escape from a hand-to-mouth existence. 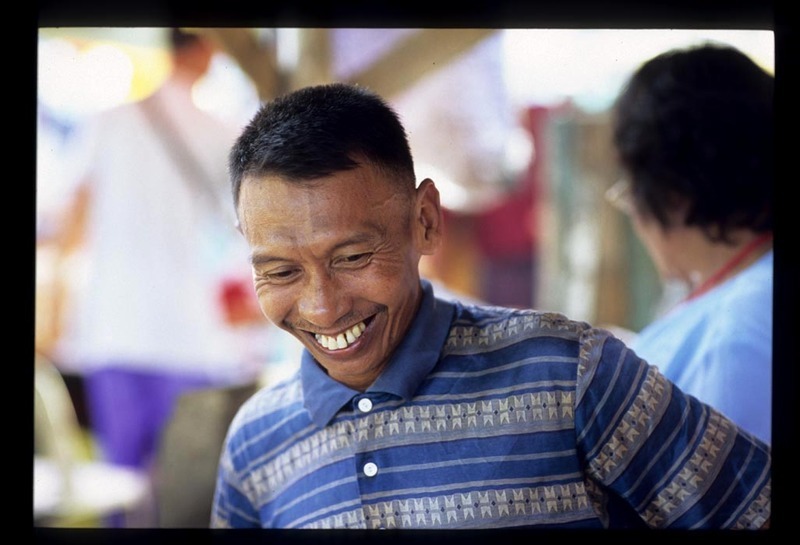 Elimination of middlemen, who took advantage of farmers' almost-constant debt to purchase their crops before harvest at below-market prices, has increased farm income and enabled farmers to make investments that will, in the future, bring them more money for better quality (or more desired) crops. Read snippets of the story and see the slideshow here. Food for thought, for Asian traditional market boosters (and supermarket naysayers) like myself. Posts have been thin this week. It's not because we've been travelling. We've been here in KL. With puppies. Six puppies and their mother. With the help of this organization we rescued them from an abandoned house in our neighborhood last Sunday, and they've been with us since. If you've never cared for six puppies at one time, let me tell you - it is alot of work. Endless work, 16 hours-a-day work (and believe me, I need that 8 hours at night!!). But not work in vain - five of the pups have already found new homes. The one above is still waiting, but we're confident she'll be rehomed eventually too (if you're in Kuala Lumpur and know someone who might be interested, contact me). This week, life trumped food blogging. And next week we will be travelling. But we'll try to get back on track soon. 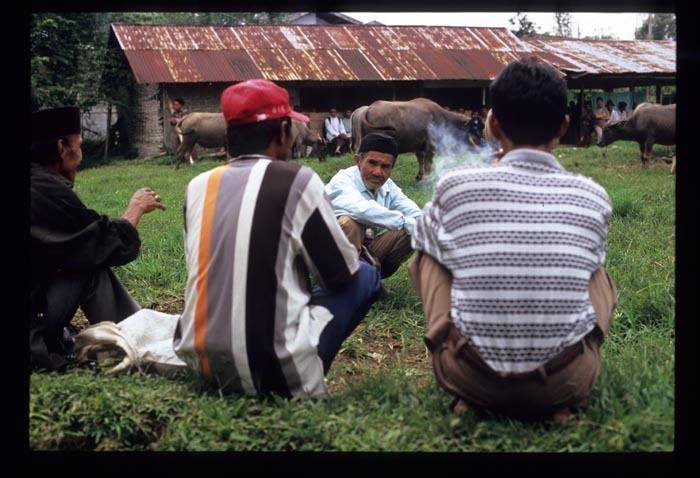 Matur, a smidge of a west Sumatran village on the road from Bukittingi to Lake Maninjau, comes briefly to life on Thursdays, when traders and customers arrive from all directions for the weekly market. 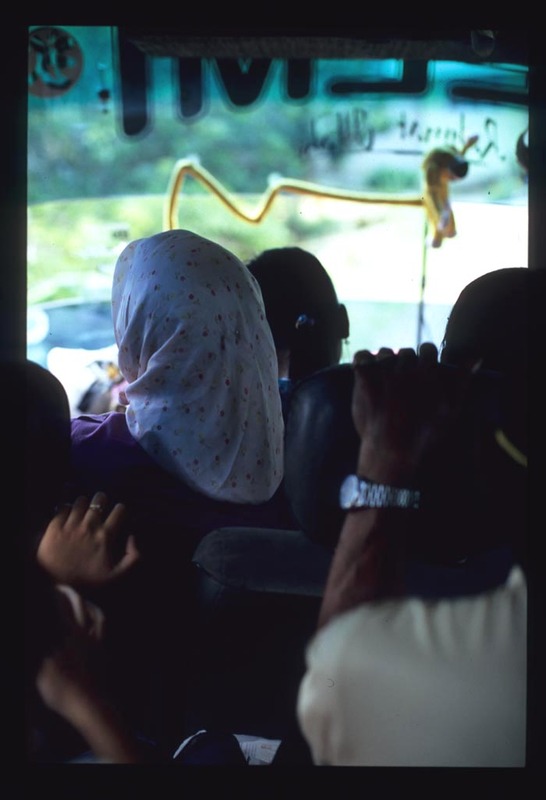 We made the journey from Maninjau village, hitching a ride on one of the many rickety buses that ply the route from Pariaman, a small city on Sumatra's west coast, to Bukittingi. By the time the bus reaches Maninjau it's well into its journey, which means it's also near to bursting with passengers - standing room only. If you want to get where you're going there's nothing to do but squeeze in, find a handrail or the back of a seat to grab onto, and hang on for dear life. 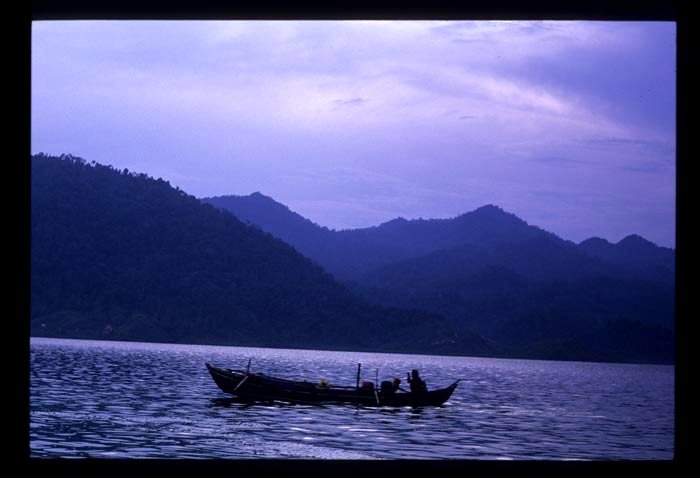 The fifteen or so kilometers to Matur stretch on for 45 minutes, as the bus weaves its way around the forty-four switchbacks that mark the road up from the lake to the hills of Sumatra's Agam region. A collective sigh rises from the passengers as the bus throws itself into each sharp turn; those without a seat struggle to keep themselves upright. When the rattling vehicle finally heaves itself over the last hill there's spontaneous clapping, accompanied by jokes and smiles. It's the Thursday before the Saturday start of Ramadan and, for some reason, the market is quiet. A good half of the stalls are barren and some of the pondok kopi are closed. 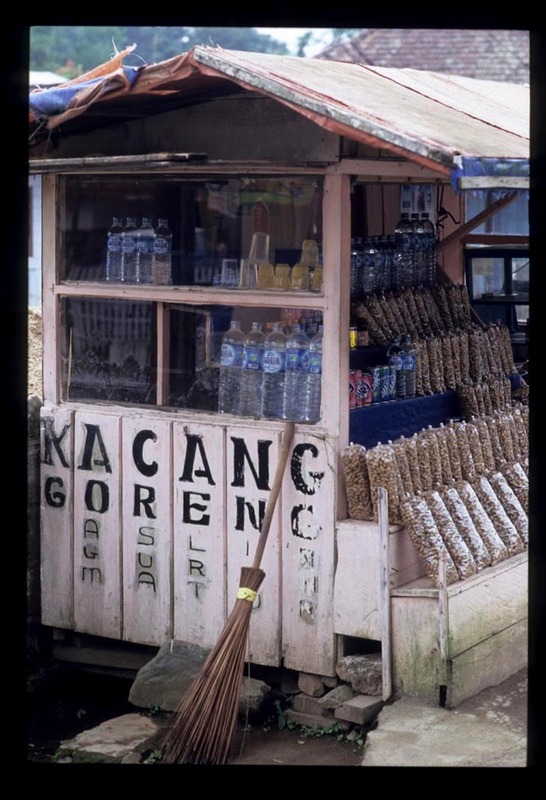 Still, at least 6 vendors peddle a Matur specialty: kacang goreng (fried peanuts in the shell). After two circumnambulations we've seen it all, and head to the street to catch a bus back to Maninjau, or on to somewhere else. 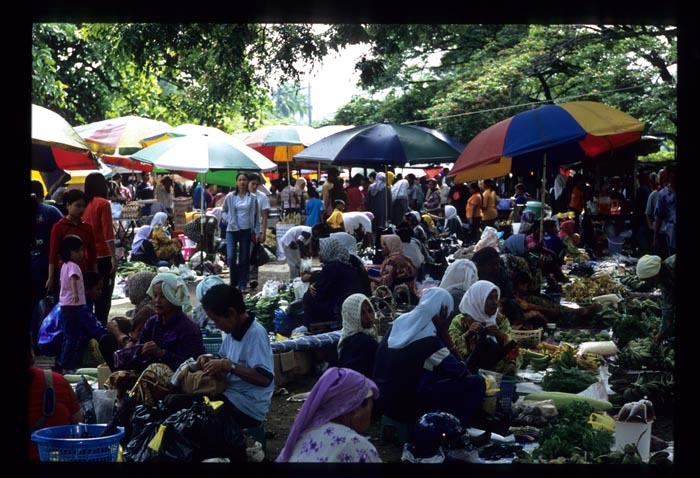 And that's when a helpful local tells us that on Thursdays in Matur the real action is at the pasar lembu - the cattle market. Following his directions, we amble down Matur's one street and then, at the first intersection, head right, towards the hills. We're in a neighborhood of neat wooden houses with bright, intricately patterned textiles hanging in their windows. After five minutes we arrive at the cattle market. We know it by its frenetic activity - not. The market takes place in a great grassy field watched over by one of the village's mosques. 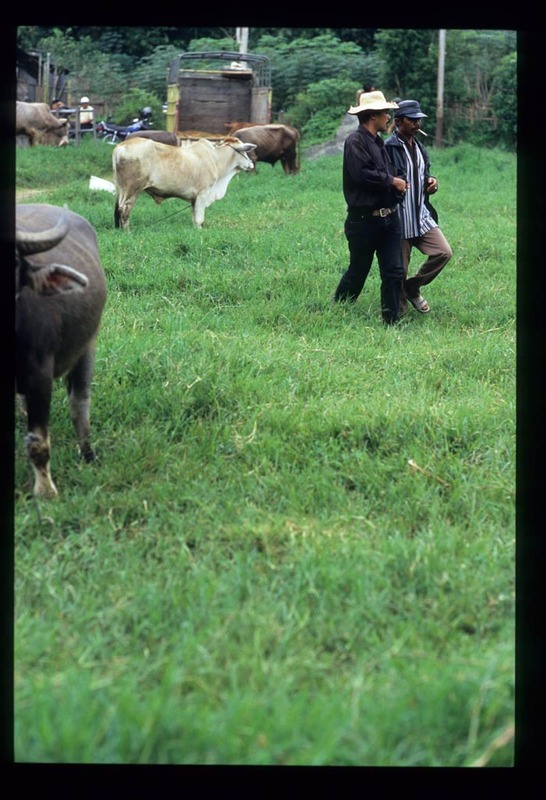 On the green, cattle and water buffalo wander, graze, and nap, mingling with owners and prospective buyers. 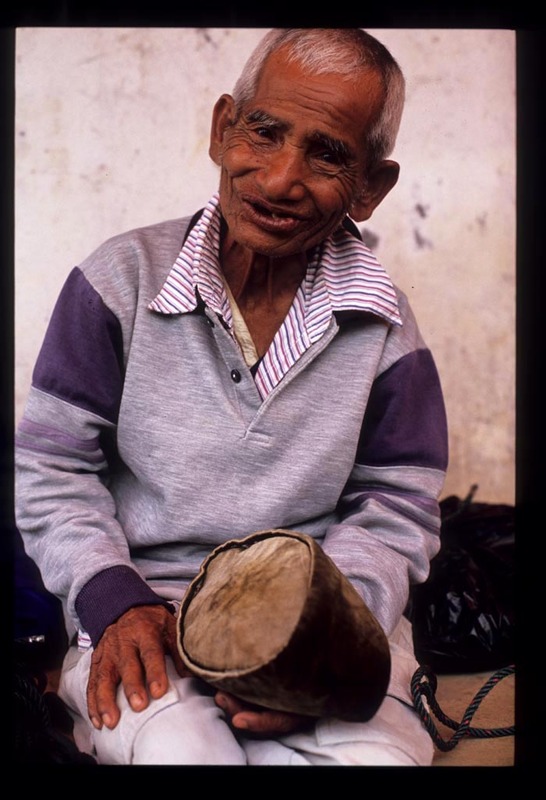 and wizened old characters whose faces hint at a thousand stories. Not a one of them can figure out what the guy with the camera is doing out in the field, gingerly picking his way around piles of dung to get close-up shots of the livestock. For a market, the place is strangely hushed. Low murmuring, accompanied by the sounds of grass being ripped out by its roots and busy jaws working cud, is broken only by occasional moo and the amplified, singsong reverie of an animal pharmaceuticals dealer. Where's the action, we wondered? Is anyone actually selling or buying anything here? They are. But not with words. Prices, we learn later, are worked out on the sly. When a buyer and a seller negotiate, they do so by grasping each other's hands as if to shake and then tapping out a sort of morse code into each other's palms. Nothing is written down, no words are spoken, and the selling price isn't revealed to anyone. This way, a seller parting with his livestock under duress isn't publicly shamed if he accepts a lower-than-average price, and a buyer less-than-skilled in judging the true value of an animal never need worry that someone will find out he's paid too much. 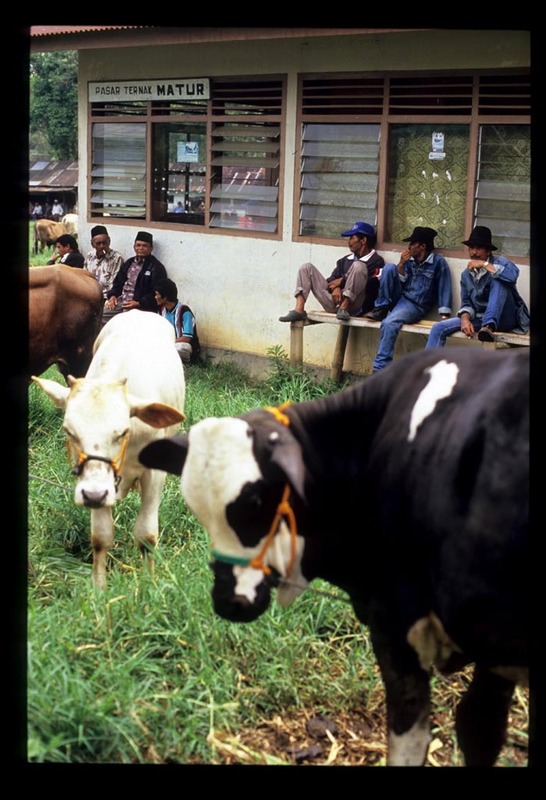 A six-month old bull might fetch anywhere from five to six million Indonesian rupiah (about U$650-750); another two and a half years of life will add another million or two rupiah (U$125-250)to his or her price. 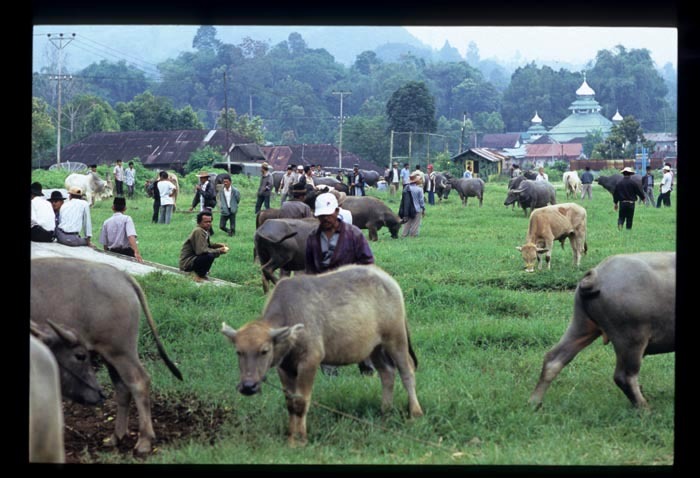 Water buffalo - bought, at least in this part of Sumatra, only for their labor (by tradition, Minangkabau do not eat water buffalo; when an animal has died it's buried as thanks for its contribution to the family's livelihood) - are pricier. 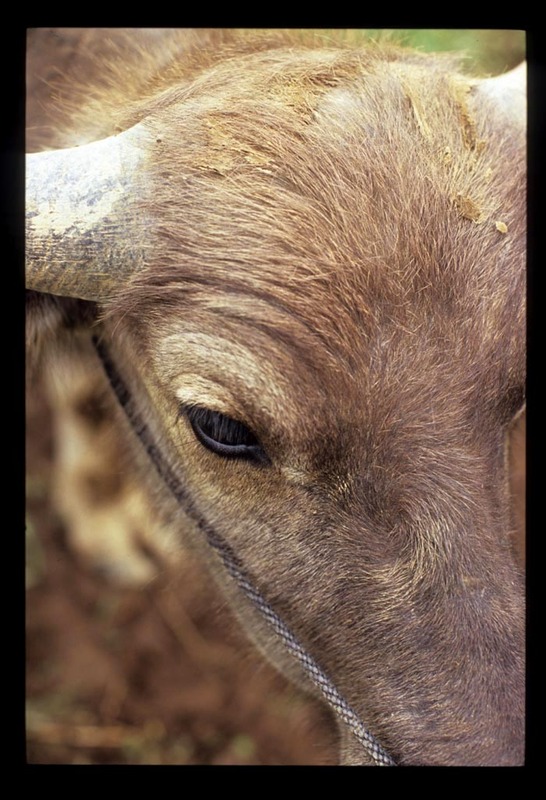 Matur cattle market, Thursdays from 6 or 7am till about noon. Matur, Sumatra (between Bukittingi and Maninjau). 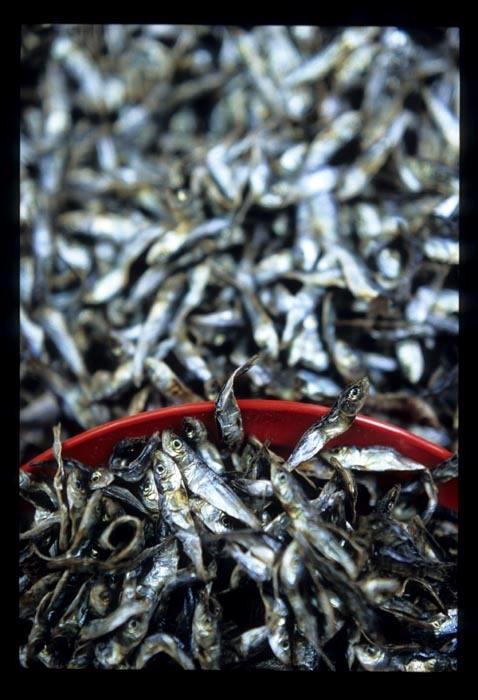 Thanks to internet travel site Gridskipper for choosing Dave's photo of ikan bilis at Kota Belud (Sabah)'s tamu (weekly market) as a recent 'Pic of the Day'. It's a favorite of ours as well, and will likely end up on our kitchen wall, dressed in a simple black frame. We haven't been to India (yet), but we're pretty sure that when we finally get there it will taste, look, and sound more than a little bit like the Klang Valley's 'Little Indias'. 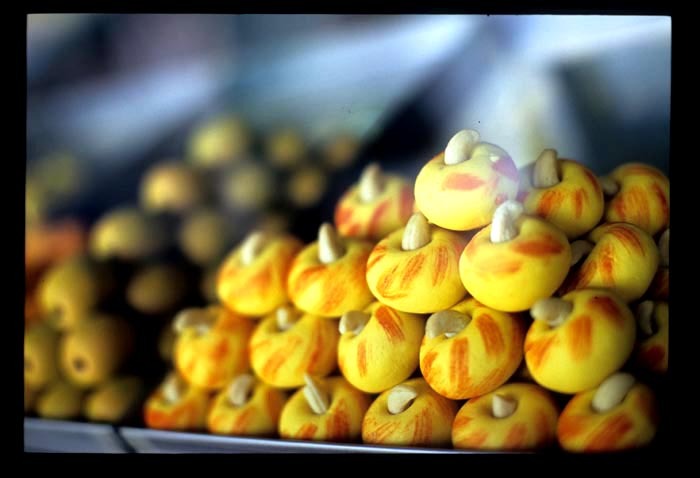 Malaysia's 'India-ness' is especially on display in the few weeks leading up to Deepavali (Diwali), India's 'Festival of Lights', when holiday treats show up at street stalls in Malaysia's Indian communities. 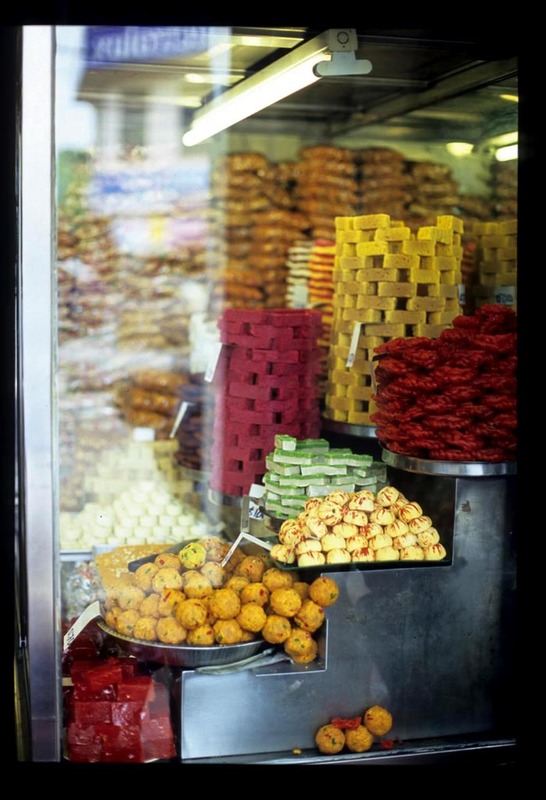 Most are sugary, a testament to the Indian love of sweets. 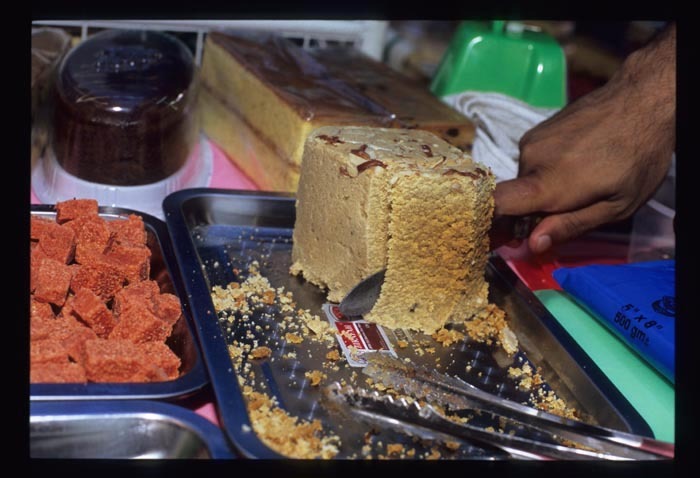 A tip-off from my Punjabi bahasa Malaysia teacher led us to this Brickfields vendor on Jalan Tun Sambanthan in the vicinity of the Seetharam shop, whose icebox is filled with Mumbai-made Kapoor kulfi (slow-melting Indian ice cream). He tells us that though the kulfi is served year-round in restaurants, it's available for individual purchase only during Deepavali. In the interest of responsible investigative journalism we picked up a box of mixed flavors (which will stay frozen for a half hour; about 40 RM for 12 pieces, 24 servings for normal eaters and 12 for greedy eaters like us). Thumbs down to the pistachio and mango flavors, which tasted flat and artificial. 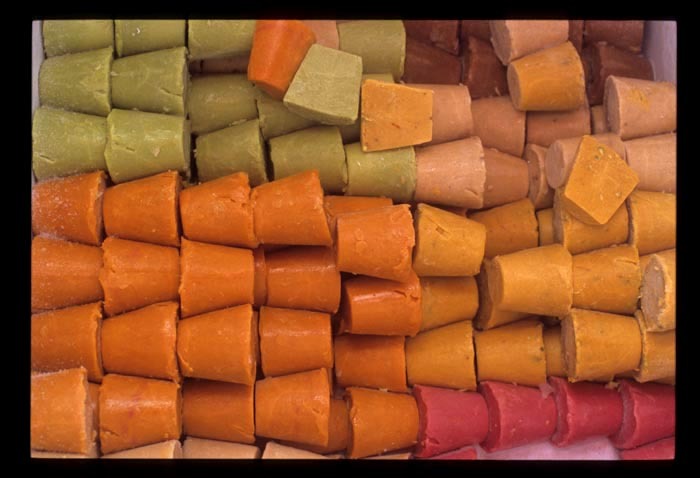 Much better were the nothing-but-full-fat-milk plain, the aromatic and nutty almond, and the intriguing, almost floral saffron-pistachio varieties. We passed on the chocolate chip and rose was unavailable; there are still more flavors to choose from. Which means, of course, that we'll be back. A few stalls away, a shy Muslim Punjabi originally from Pakistan is selling a selection of homemade treats. Though he's has worked at a restaurant in the Jalan Masjid India area for years, this is his first year doing business at the Brickfields Deepavali market. He says business has been 'not bad' but we suspect it's much better than that, judging by the loveliness of his offerings. 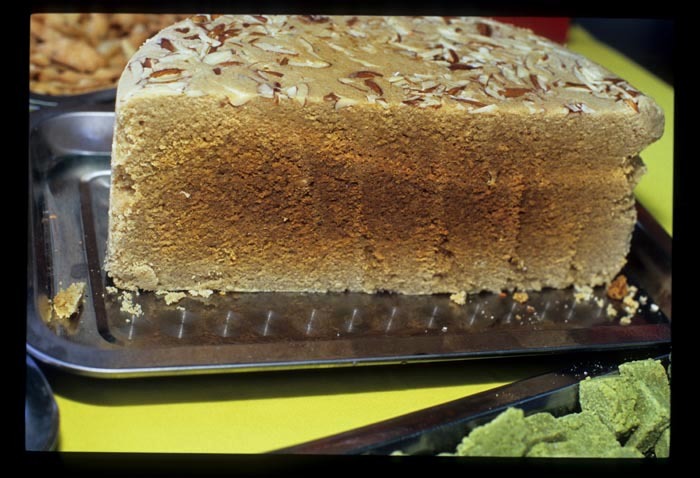 We were drawn by his alwa (halva), an almond-crusted, 6-inch high cake of caloric goodness. 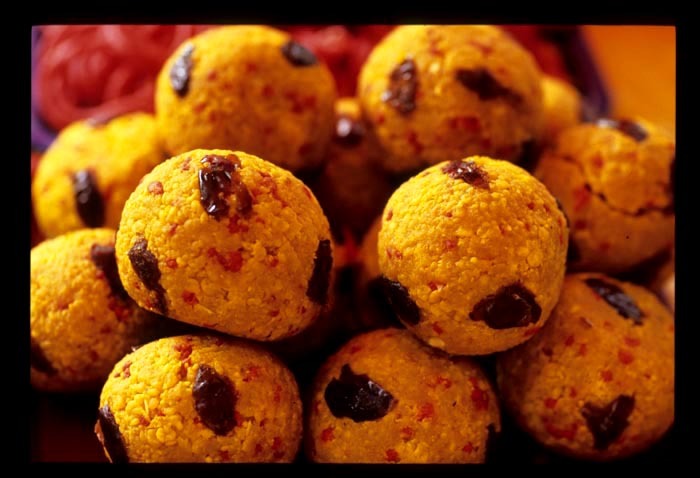 'A Punjabi favorite!' declared a gorgeously coiffed and made-up customer, as she handed over payment for a quarter of his supply. We opted for just 100 grams (RM 5) and immediately regretted not purchasing more. We're not sure what's in this alwa - other than almonds, sugar, and lots and lots of ghee - but it's got a great texture (half moist-cakey, half crumbly) and a real depth of flavor that intensifies and becomes caramel-like towards its dark middle. 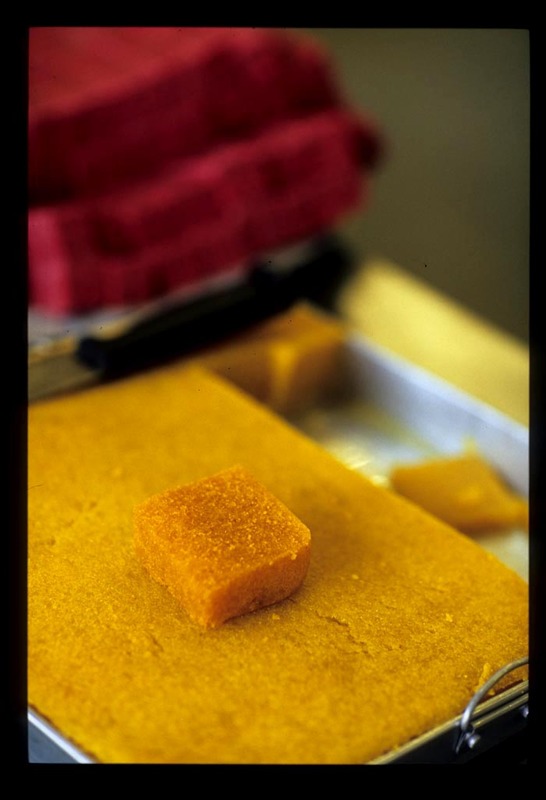 Keep an eye out also for his patisa (1 RM for 100g), a gorgeously textural daal flour-based sweet that separates into layers as if it were delicate French pastry. 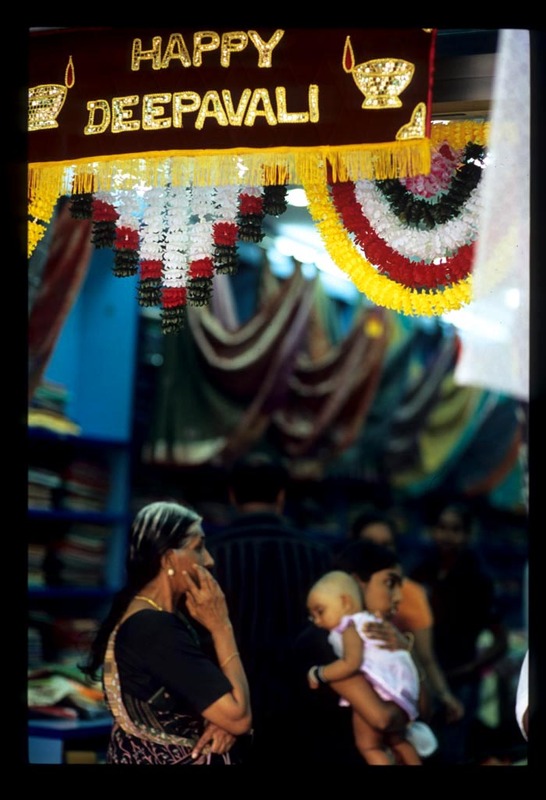 On the same strip, but in the direction of KL Sentral, the shelves just outside the entrance to the Bombay Point House of Fashion are laden with handmade Punjabi papad, to toast at home on a hot nonstick skillet, under the broiler, or (carefully) over a gas flame. Made with various daal flours, these papad are nicely legume-ish in flavor, noticeably less salty than the packaged types sold in grocery stores, and bursting with spice. The red chile and white chile (fresh chilies that have been soaked in vinegar and then dried in the sun) varieties are numbingly incendiary, the Amritsar mild but no less flavorful, with its cumin and fennel seeds. We'll return for more of these and other flavors such as green chile garlic and urad daal with black pepper. On our first visit we spied packages of black daal papad but, sadly, they seem to have permanently disappeared from the shelves. At Klang's Deepavali market keep an eye out for a Tamil woman and her son selling these unusual steamed rice flour and jaggery (palm sugar) sweets. They're named (help, readers?) 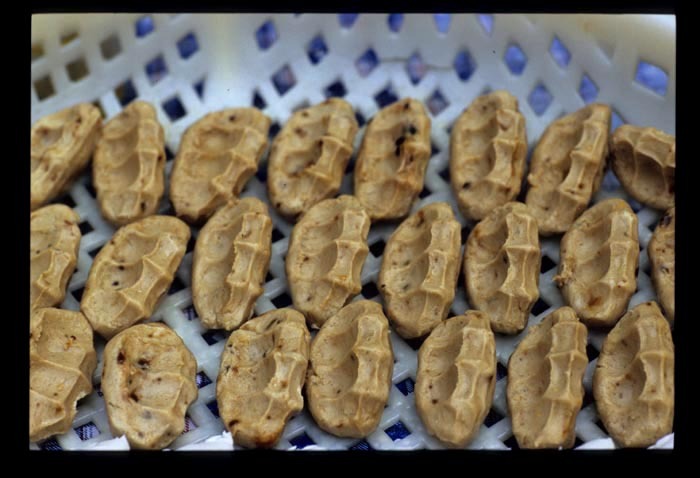 for the way they're formed, by squeezing a piece of dough with the fingers. Novelty aside, they're not exceptionally tasty - gummy and rather plain. Better are the white 'dumpling' pastries sold alongside (name? ), delicate sweet dough hiding a delicious daal, sugar, and shredded coconut filling. 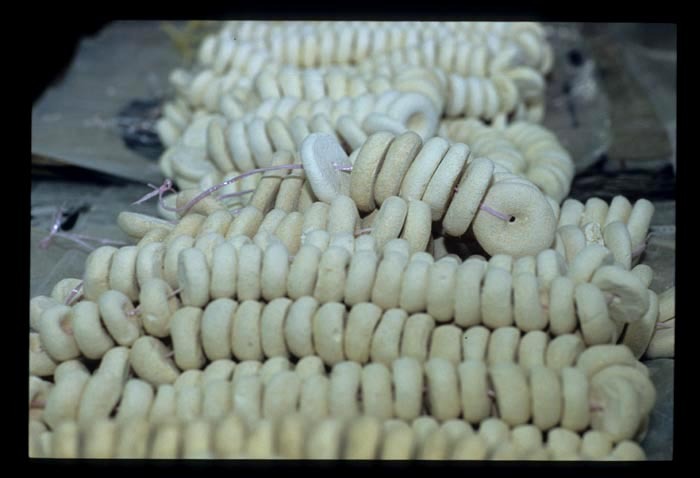 These vendors also offer freshly steamed string hoppers (thin rice flour noodle 'nests') to eat with jaggery. Ladu, sweetly spiced daal balls, are not a special-occasion treat ... unless they're huge and studded with soft dates, as these are. I'm not normally partial to ladu, but was won over by the moistness and heady cardamom scent of this version. Even under the best of circumstances, however, a 6-inch ball of sweet daal is more than I can handle on my own. There's really nothing Deepavali-ish about Jai Hind's window display. It's pretty much the same year-round, which is to say: enticing. Probably Klang's best-known sweets shop, Jai Hind - no relation to the Kuala Lumpur shop of the same name ('Madame!! They are [Punjabi] Sikhs, we are Indian!!') 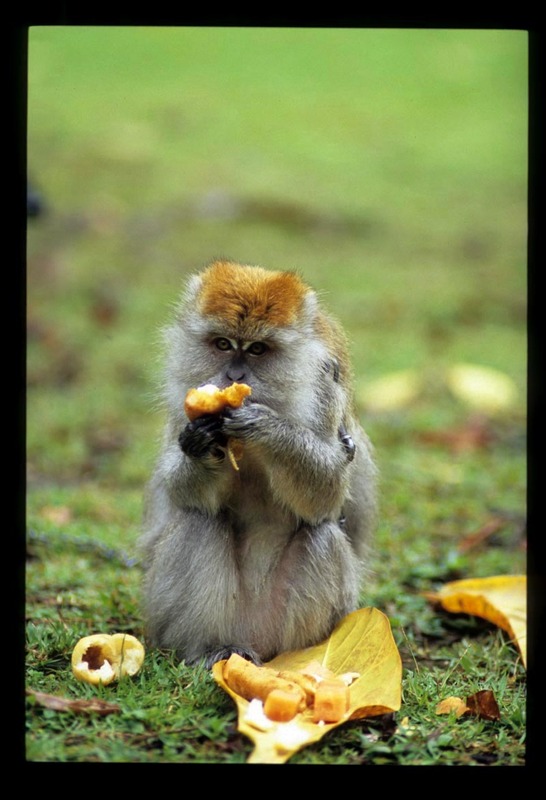 -sells just about any sort of fix for the sweet tooth, including gorgeous mini fruit-alikes. We particularly like Jai Hind's sugar-soaked suji (semolina) and cornmeal (? )-based cake, with its nubbly texture and subtle spices. Also available year-round is the Madras masala milk served at Asoka Curry House. You'll know the place by the huge wok of frothing yellow tinted milk streetside, near the cash register. Though perhaps not the most refreshing thing on a hot afternoon, this concoction of fresh cow's milk infused with hazelnut, raisins, cashews, cardamom, dried ginger, 'herbal nuts' (unspecified), and saffron is smooth as a rich custard, reminiscent of melted ice cream, and perhaps worth a trip to Klang in and of itself. 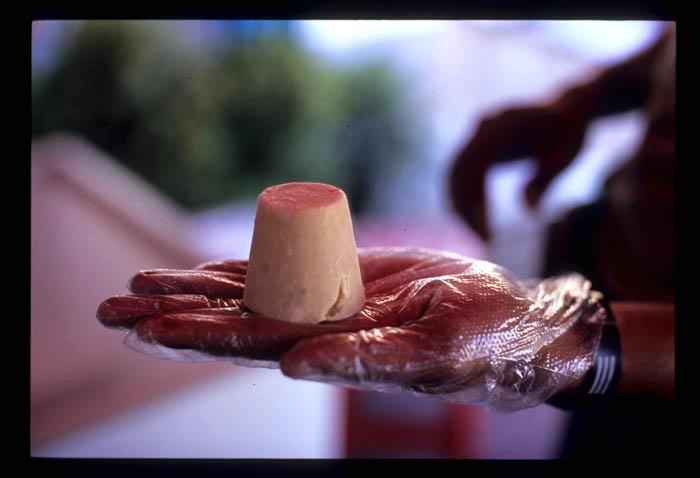 The Brickfields kulfi stall is near Seetharam, on Jalan Tun Sambanthan (if you're approaching from Jalan Bangsar, turn right at the intersection and make the first U-turn; it's on your left). 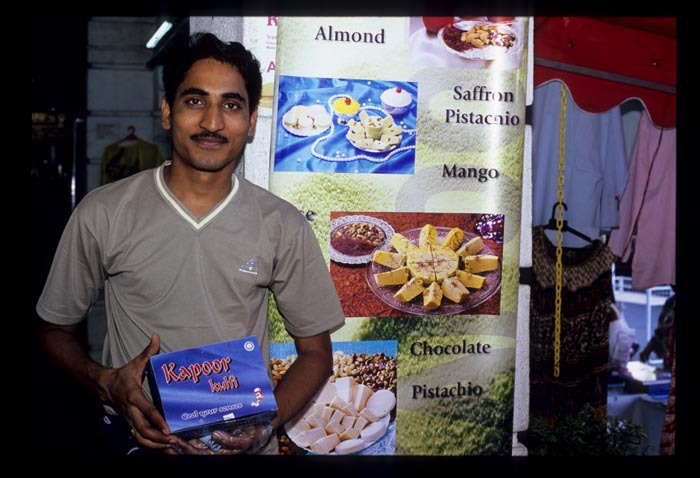 The alwa/patisa stall is near the kulfi stall, towards the U-turn. The papad stall is directly in front of the Bombay Point House of Fashion, a jewelry shop (pay for papad inside the shop), near the kulfi stall but in the opposite direction, towards KL Sentral. Klang Deepavali Market, 'Little India', Jalan Tengku Kelana. If you're approaching from the bridge, Jai Hind and Asoka Curry House will be on your right, and the tamil sweets stall is down an alley off of Tengku Kelana between those two shops, on your left as you walk down the alley. Huge ladu from a stall on the opposite side of the street. Wet marketing is the best way we know to ground ourselves when we've landed somewhere new (or to re-familiarize ourselves when we're repeat visitors). Marketing is how we get a bead on local products and produce and acquire advance knowledge of what to look for in local eateries. It's total immersion. In Asia, every market - even the ones we've cruised fifty times over - promises to surprise. Markets are, of course, a place of business. But they're also where news and gossip, conjectures about the weather and the harvest, opinions on local politics and, during festival periods, good wishes and small gifts are exchanged. 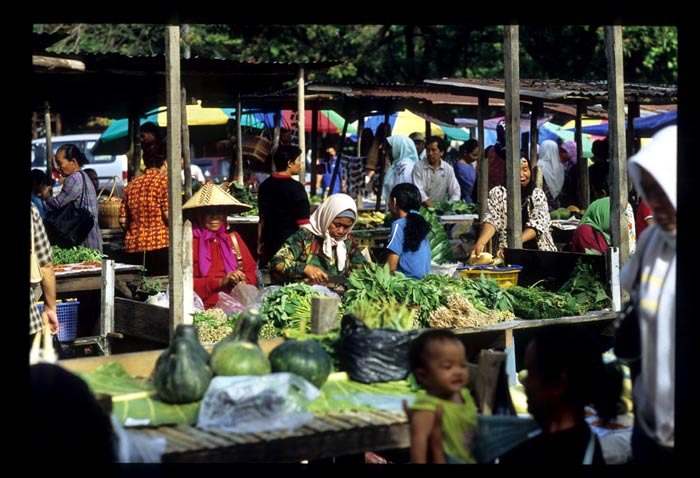 Almost every town in the Malaysian state of Sabah holds a tamu (a once-a-week-market). 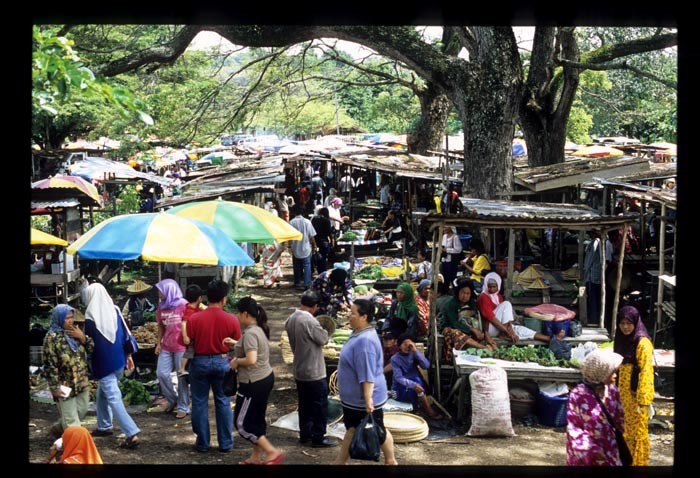 One Sunday last April we chose to skip Kota Kinabalu's famous Sunday market in favor of the Sunday tamu in Kota Belud, a sleepy town about an hour up the state's western coast. After an easy, picturesque drive that cut through forested hills and offered enticing glimpses of cloud-shrouded Mount Kinabalu and a tranquil, impossibly blue South China Sea, we took in an Asian market connoisseur's fantasy: under a canopy of old shade trees, a jumble of outdoor stalls extending on and on, as far as the eye could see. The tamu seemed, at first glance, a bright, buzzing, hectic mess. As we made our first round of the stalls, however, order emerged. 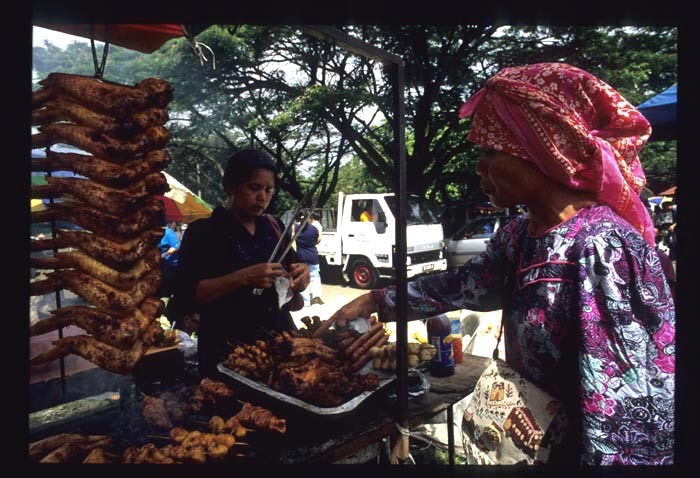 At the front of the market, mostly female vendors peddle their products from permanent corrugated metal-roofed stalls. Cultivated vegetables - lettuces, Chinese greens, carrots and eggplants and green peppers, garlic, onions, ginger, fresh turmeric, and leafy herbs - figure prominently here. 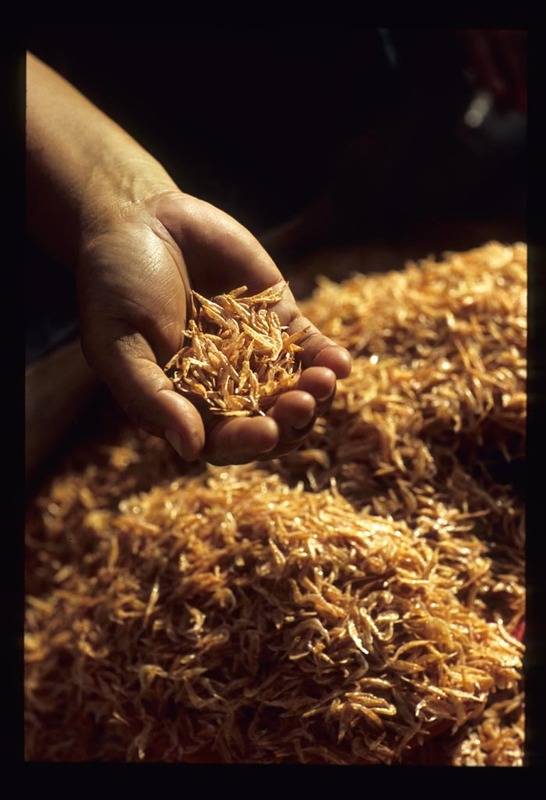 moist, fresh belacan, and bukuk, minute dried shrimp, sold by - among others - a Kuala Lumpur native named Norlinda. 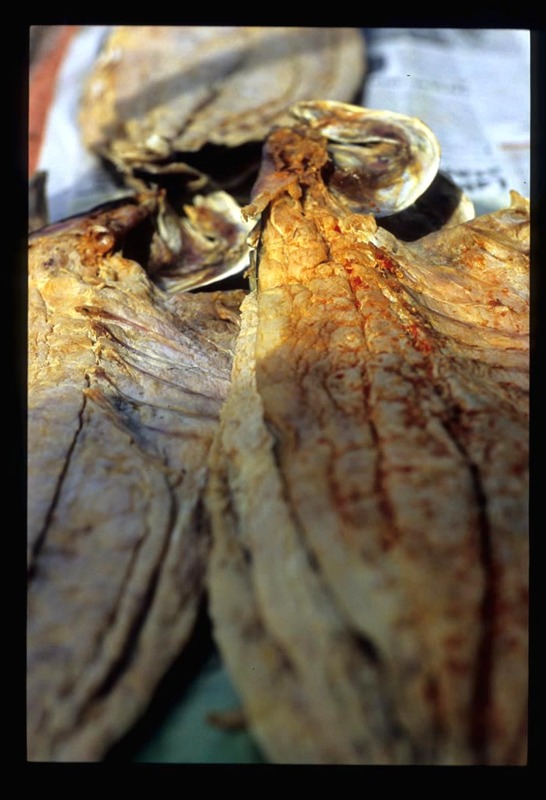 Bukuk, she tells us, are dried in the sun just two or three days. They smell clean and briney, are barely-there but crunchy on the tongue, and are delicious stir-fried with eggpplant. or wood-grilled chicken wings (a Sabah specialty). To the market's rear, past the few Bajau (Sabahans originally from the Philippines, and reknowned for their skills as horsemen) offering cattle for sale, a chain link-fenced area houses the non-permanent part of Kota Belud's tamu. Unlike the vendors up front, who rent a specific stall for blocks of time, sellers here pay for their space on the ground, claimed when they arrive, on a week-by-week basis. Much of the produce sold here is foraged. 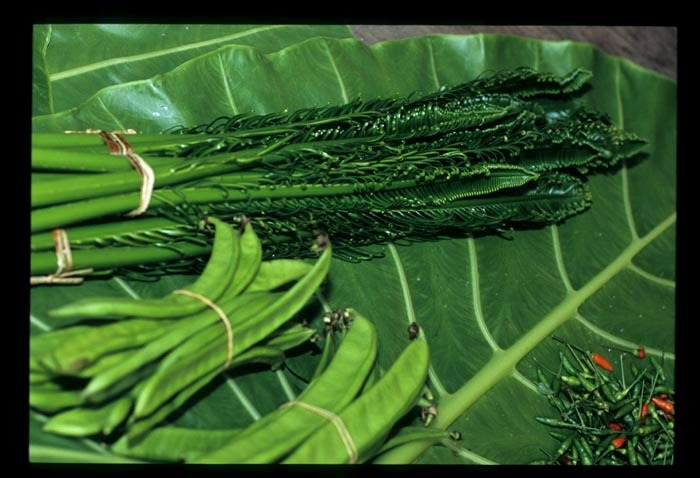 The ferny pucuk kemuning below, found around wetlands, is blanched and eaten in a salad or with sambal, or added to soups. 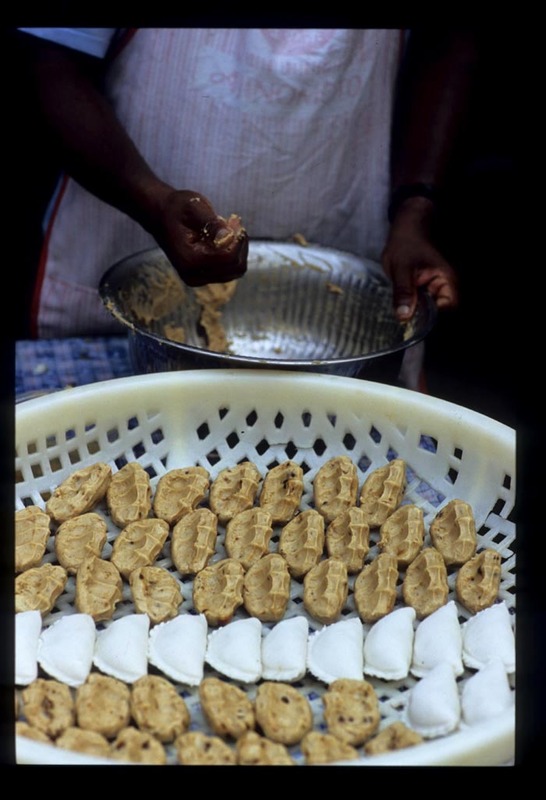 Sasad, or yeast beads, are in abundance as well. 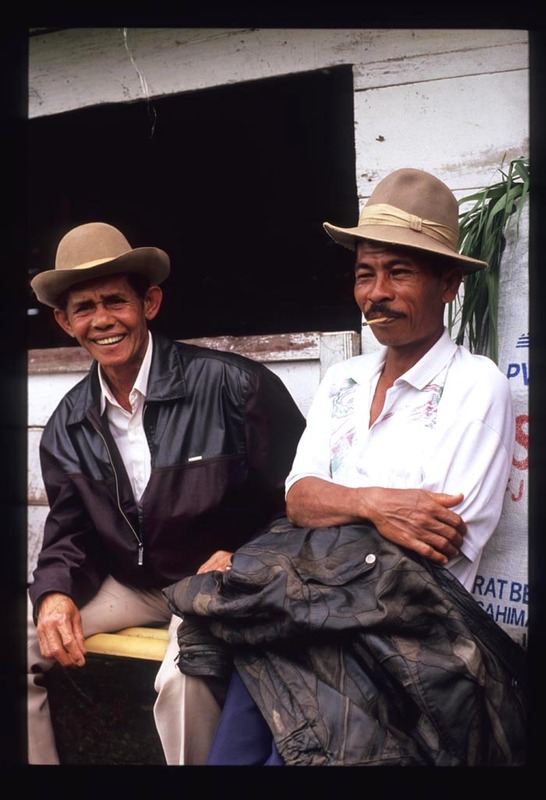 They're used to ferment rice for the production of lihing, an alcoholic beverage made by non-Muslim Kadazandusun, Sabah's largest indigenous group. 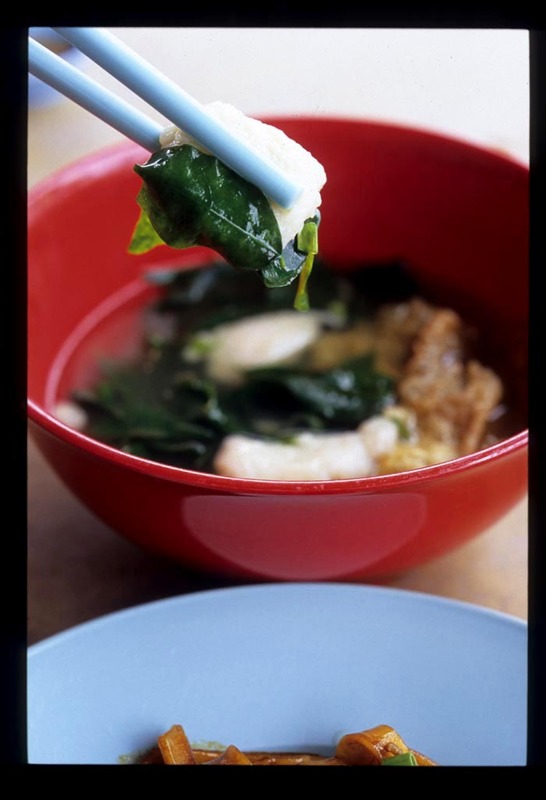 In addition to being taken straight, lihing finds its way into Kadazan dishes like gingered chicken soup. 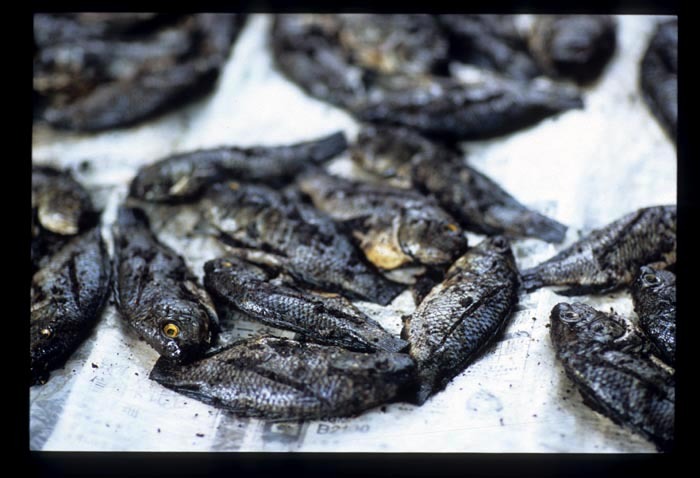 Fresh fish (opening photo) and other products of the sea occupy an area of cement ground directly adjacent to the permanent section of the market. 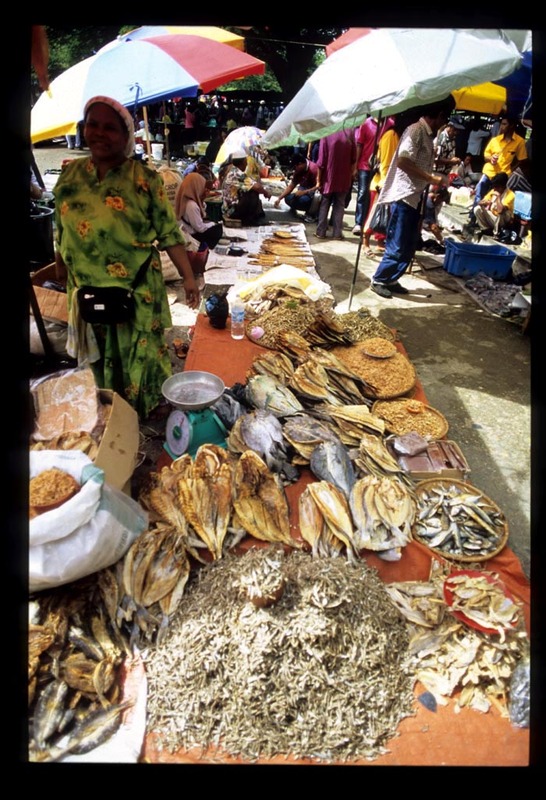 This vendor offers a jaw-dropping variety of dried sea products, including squid, prawns, and fish ranging in size from fingertip-long ikan bilis to foot-long, rainbow-colored parrot fish. 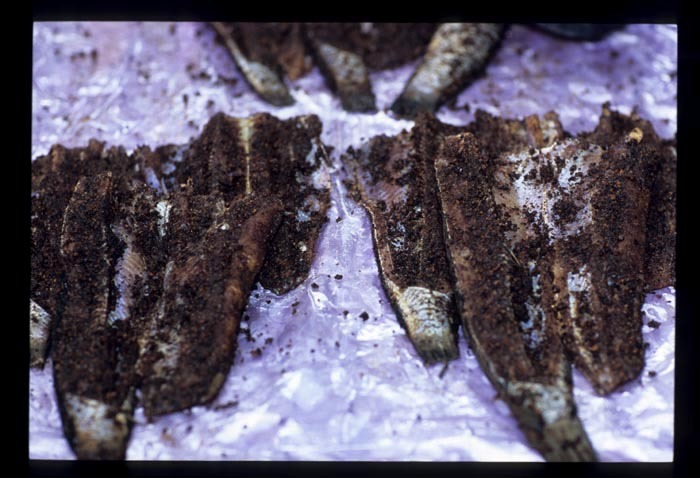 and whole, is preserved with what may be ground pangi nut (buah keluak). 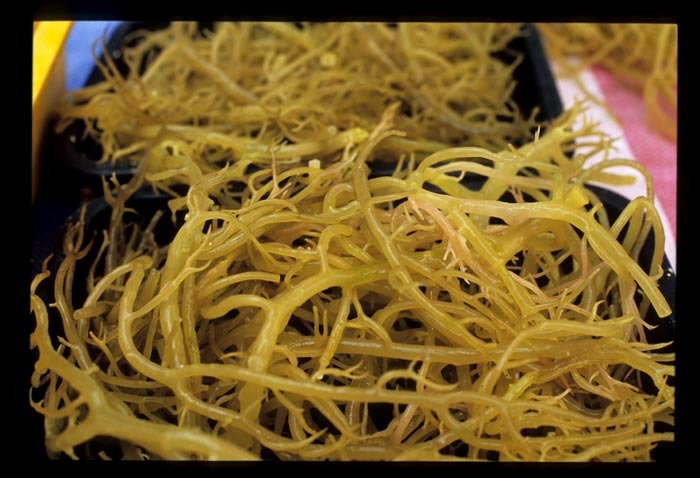 The culinary influence of southern Philippine Muslims, who have settled in Sabah over the last two centuries (the Philippines claims parts of Sabah's territory), might be seen in the tamu's edible seaweeds. 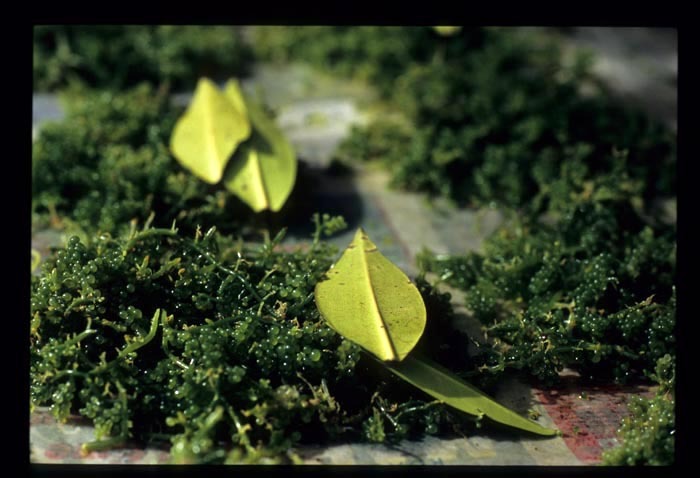 Particularly abundant are clusters of what look like small green grapes. The seaweeds are eaten raw, seasoned with garlic and/or ginger and soured with lime or kalamansi juice, or coconut vinegar (a staple of the Philippine pantry). Kota Belud tamu, every Sunday morning. Sabah's largest and, therefore, most touristed. Get there by 7:30am or 8 to enjoy a couple of tour bus-free hours. Readers, we've been holding out on you. Last June, after eating our way around Padang, cruising food markets in Bukittingi and neighboring, and taking in the views from the shores of Lake Maninjau, we landed on a little bit of heaven off the coast of western Sumatra called Cubadak Island. I'd planned (but never got around to it) pitch a blurb on Paradiso Village resort to a food or travel publication, so we kept this exquisite vacation jewel to ourselves. Now that I've been scooped by TIME, we might as well come clean. For us - non-'resorty' ('resort wear' is not a part of my wardrobe), hyperactive travelers who tend to get bored after a couple of days of sun and sand - this collection of thatch-roofed bungalows on a large, but nearly uninhabited island is about as close to perfection as a vacation spot dedicated entirely to indolence can get. After a long, hot ride down the coast and a Mayday call to Nanni, the resort's owner, we arrived two days before our reservation. It was the last week of our vacation, and we'd hoped to get in a couple more days of mainland travelling, so we had mixed feelings about ditching our plans and heading to Cubuduk early. 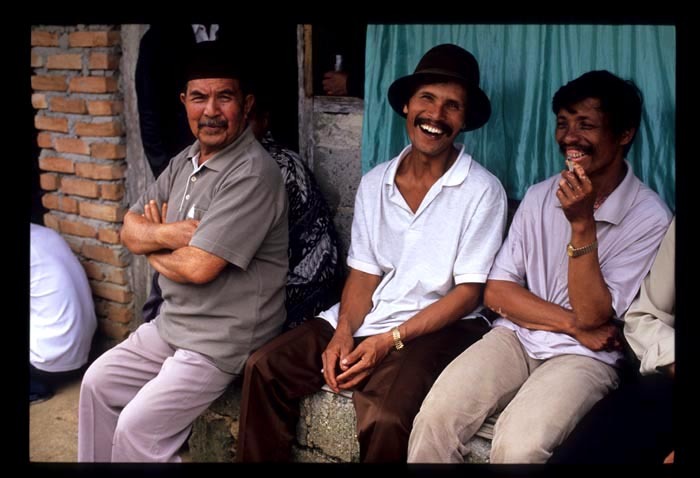 Our doubts began to ebb as our boat approached the dock, where Nanni, the picture of tropical relaxation in perfectly pressed white jeans and a crisp checked shirt, waited to greet us. 'Something cold to drink?' he asked, as he led us into Paradiso's lounge/bar, which sits on stilts over the water (right, photo above). After an icy beer we dragged our sweaty bodies to our accomodation, the resort's one over-water bungalow (top photo), changed into swimsuits, and jumped off our deck into our own private square of sea. By the next morning, when we woke to the sound of gently sloshing sea beneath our floor boards and a view of nothing but ocean, sky, and the velvety green hills of the mainland from our door, Paradiso had worked its magic. We forgot about the lure of exploring more villages and more towns, bigger and better markets, and new food finds, and set to doing something we hadn't done in a quite a while - nothing at all. Paradiso Village will not appeal to travelers who can't live without air-conditioning, TV, in-room internet access, swimming pools and spas, and copious, fauning staff hovering nearby to cater to their every whim. But neither is the place quite as 'rustic' as the TIME article implies. This is no backpacker sweltering-huts-on-the-beach operation. Bungalows are carefully constructed with high-quality fittings and decorated with local textiles. Huge windows and ceiling fans assure a constant breeze; mosquito nets keep out the few bugs. 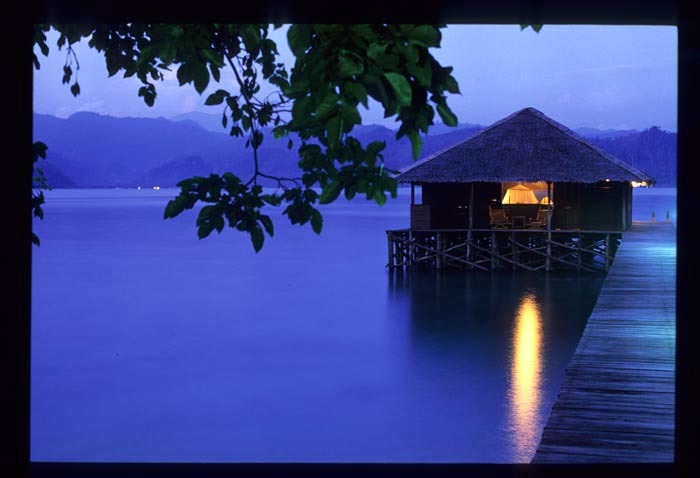 The one over-water bungalow features a large indoor sitting area, a walk-in wardrobe closet, and, on the covered veranda, a minibar with fridge. All units are equipped with water boilers. Not luxurious, but not so simple either - and very, very comfortable. It's the Italian touch, however, that makes Paradiso Village so special. Nanni and his wife Federica, Turin natives, run a tight but laid-back ship. Accomodation is spotless, service is friendly but impeccable, the atmosphere is homey. Being at Paradiso Village feels more like visiting the tropical estate of a well-endowed relative or close friend than staying at a resort. As might be expected when Italians are in charge, food is anything but an afterthought. Breakfast is taken when you like - perhaps a little homemade yogurt, some tropical fruit, a bite or two of sweet cake, eggs or French toast. 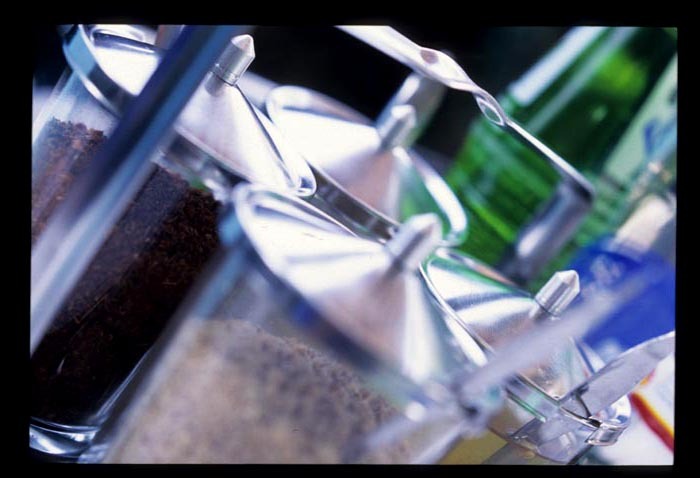 To drink, unfiltered Sumatran coffee or espresso pulled from the restaurant-grade caffeine machine. 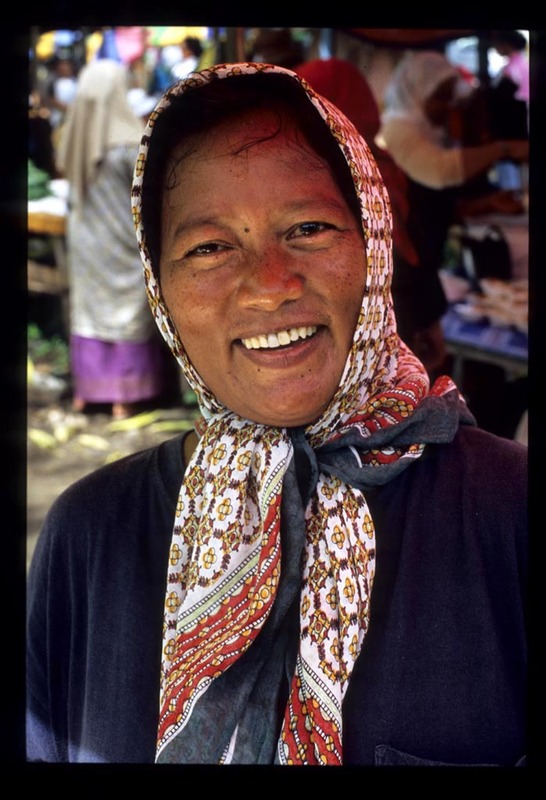 Lunch and dinner, eaten communally, are an inspired mix of Indonesian and Italian dishes. Every meal includes seafood (but also meat or chicken) of one sort or another; boats chug up to Paradiso's dock early in the morning, and Nanni and Federica select what's best. If you're lucky, sweet mangrove crab, prepared with a ginger sauce, will be on the menu. 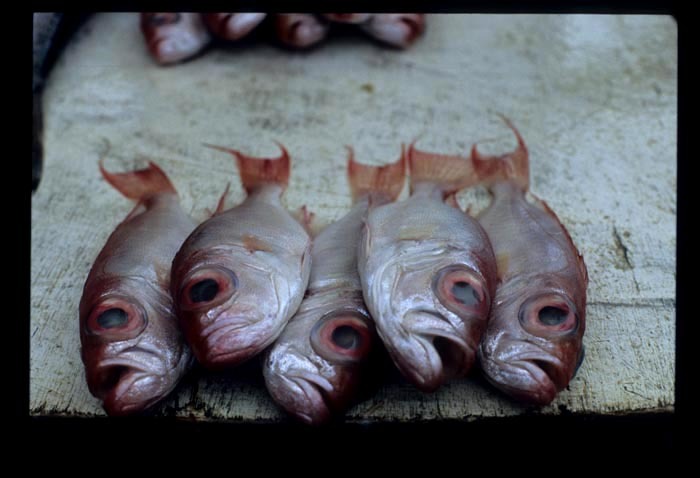 Or perhaps a gigantic grouper, lightly fried and doused with a savory taucu (soybean) sauce, polpette di pesce - moist balls of chopped fish seasoned with Italian herbs - or briney seafood pasta. Maybe a tender rendang or a fiery preparation of red chile sambal and jengkol (a chestnut-like legume). Vegetables - nangka muda (young jackfruit) blanched and served with olive oil and lemon juice to bring out its artichoke-asparagus notes, thin slices of caramelized roasted carrot, a salad of cabbage or Chinese greens - are abundant. Always gracing the table, a bottle of fine extra-virgin olive oil for drizzling. And desserts, such as flawless meringue to submerge under chocolate sauce and whipped cream, a light but rich flan that's a coconut lover's dream, expertly fried beignets stuffed with coconut and palm sugar, or an impossibly dark chocolate and coffee ice cream, are incredible. Nanni is quite the mixmaster, but even teetotalers won't want to miss aperitivo/cocktail hour starting at 7, when the kitchen sends out a steady stream of freshly prepared cocktail snackables like Brazilian-inspired sweet corn cakes and kerepok bayam (huge 'spinach' leaves dipped in a tempura-like batter and deep-fried). There's ample opportunity to work off the calories - a twenty-five minute hike up the near-vertical hill directly behind the resort, for instance, or a more gentle, but longer, hike along the island's coast. 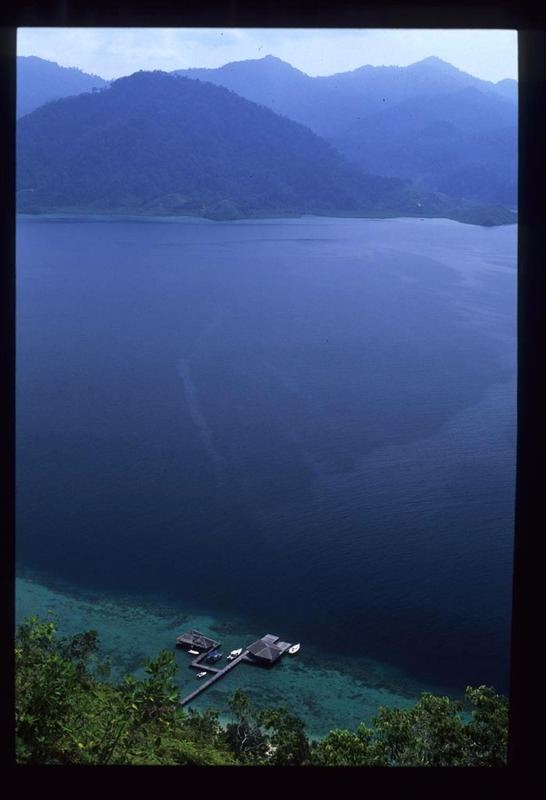 There's a dive center, twice-weekly jaunts to nearby islands for snorkeling, diving, and a substantial picnic (pepper-marinated grilled mackerel steaks), and Nanni can arrange two (or more) day trekking trips on Sumatra or to the Metawi Islands. Paradise indeed. We boarded the boat for our trip back to KL with lumps in our throats and thoughts of returning - as soon as possible - in our heads. One of our favorite Paradiso Village desserts. Many thanks to Federica for sharing it. 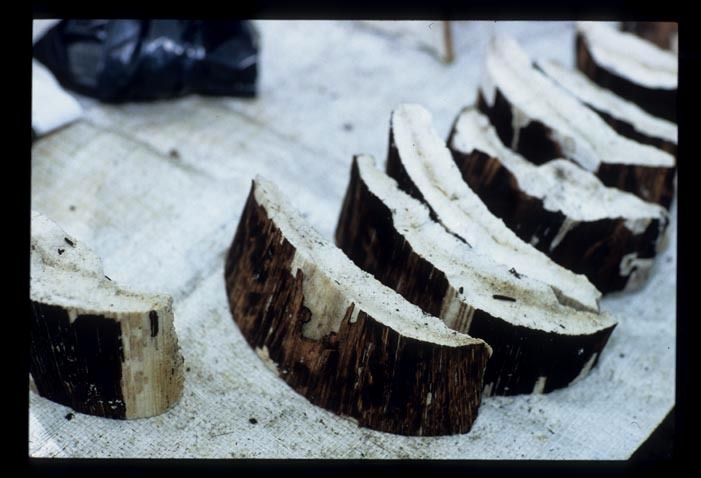 Fresh coconut can be substituted for dessicated. 1. Preheat overn to 180C/350F. 2. Toast the coconut in the oven (180 C/350 F)or in a heavy skillet over medium heat, stirring often so it doesn't burn. 3. In a buttered (or nonstick) 8-inch round cake pan combine sugar and water and melt on the stove over medium-low heat, stirring constantly. When the sugar-water turns light brown remove pan from heat, swirl the mixture to coat bottom of pan, and set aside to cool slightly. 4. Mix milks, eggs, and coconut in a large bowl and pour into the baking pan. 5. Place pan in a larger ovenproof dish or pan and place in the oven, then pour boiling water halfway up the flan pan. Bake for approximately one hour, or until the flan is only slightly jiggly in the middle. Remove, set aside for 10 minutes, and turn onto a plate. Serve cold or at room temperature. 6. Optional - toast about a cup of coconut and set aside to sprinkle over the flan before serving. 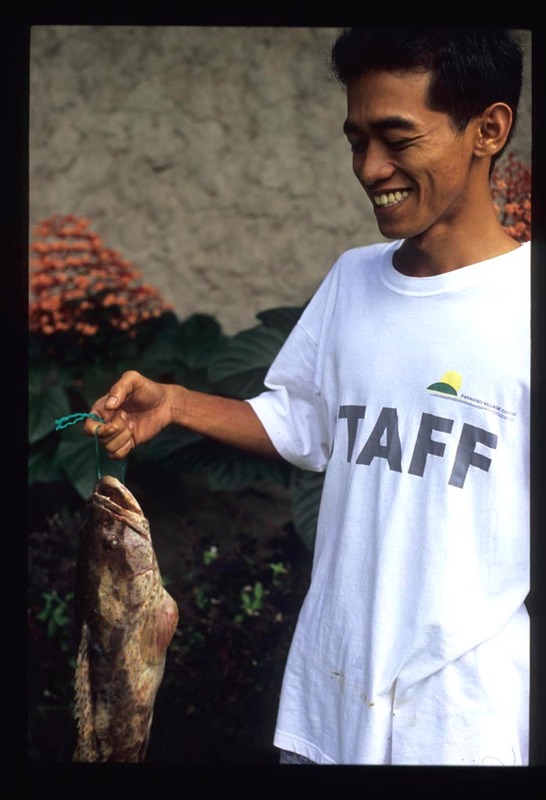 EatingAsia's first birthday passed quietly last month. We'd forgotten all about it, in part because neither of us are good with dates (family and friends, used to receiving birthday cards and Christmas gifts months late, if at all, will testify to this), but mostly because for us markers of our stay in Malaysia have less to do with measures of time than with measures of taste. 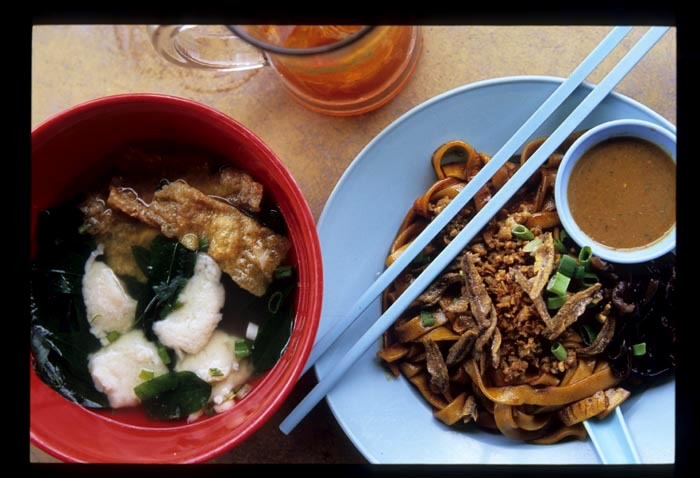 In our first months every Malaysian dish we sampled was wonderful, fantastic, spectacular. But over the past 14-plus months of enthusiastic eating we've honed our palates and, in the process, raised our standards. We can - and do, often - compare this version here with that version there and pass what I'd like to think is sound judgement. This, more than the passage of days and months, tells us we're not just visitors. 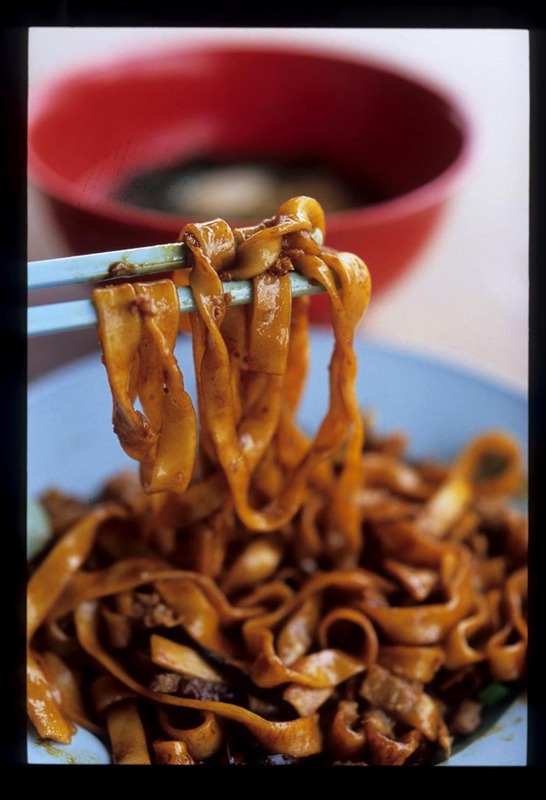 We haven't blogged pan mee ('board' noodles - named so, I presume, because they're rolled out flat as a board) since September 2005. We still love Kin Kin's pan mee and go-with, sandy-textured chili paste (it's one of the few spots in KL that we've visited more than once); it's in a class all its own, not useful for comparison purposes. But we think we've been introduced to a classic pan mee that beats, hands down, the the Bangsar version lauded in that year-old post. What is it about this vendor's wide, taglietelle-ish pasta? It's thick and substantial, tender but a bit chewy, wheaty and flavorful. This woman could go head-to-head with a pasta-making Italian nonna and quite possibly come out the winner. What's more, this pan mee is cooked absolutely al dente, with just the right amount of bite left in the noodle. You can have it in soup, of course, but for us this pan mee's born to be taken dry, tossed in dark soy and garnished with a jumble of stir-fried chopped pork and crispy minced garlic, a tangle of shredded fresh wood ear mushrooms (toothsome, and intriguingly bitter - a good balance for the sweetness of the soy), scallions, and yummy ikan bilis (dried anchovies), substantial in size and expertly fried to a non-greasy crunch. Reddish-brown dipping sauce is heavy on the belacan (shrimp paste) - much more so than your usual pan mee dip - and fiery. On the side, a meaty broth chock full of fish paste (ask for extra) hand-formed into uneven patties, fucuk (deep-fried tofu skin), and lots of spinach-like (in flavor) sweet potato leaves. Since being guided to this pan mee heaven by our friend SL I've been back twice. That's a lot of pan mee from the same vendor in two weeks, especially for a gal who can count on one hand the KL eateries she's given repeat business to in the last year. 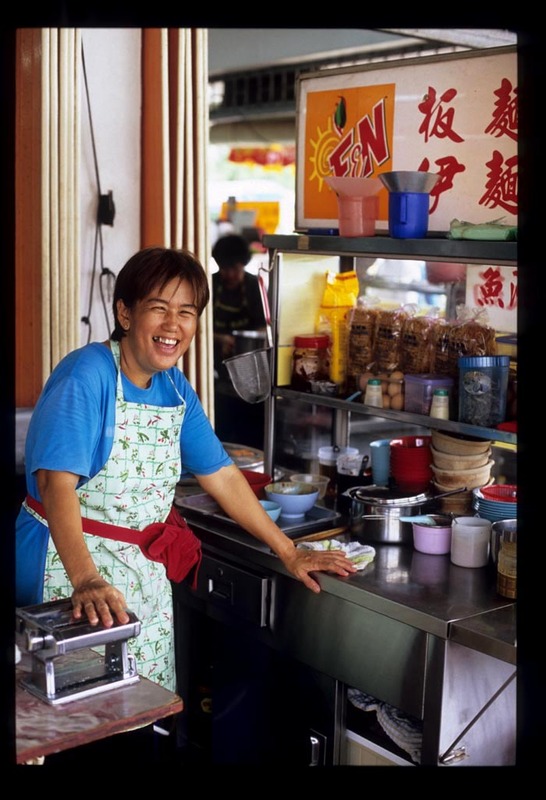 Pan mee vendor at Kedai Kopi Wah Cheong, Jalan 17/29, Section 17, Petaling Jaya. Early morning-230p (on a recent Saturday she was sold out by 1p), closed Thursday. This is Wan. She's our maid. There, I've said it. Such a revelation wouldn't elicit a blink of the eye in Asia, where it's not uncommon for middle- and upper-class households to have someone (or several someones) in to clean, cook, and tend to the the kids. But we Americans are notoriously squeamish about domestic help. We'll happily take our shirts to the laundry to be washed and pressed, eat in restaurants where underpaid servers depend on our good graces to make up the difference in tips, and pay others to massage our feet, trim our cuticles and paint our toenails, and wax our bikini lines. Yet we're uncomfortable with the idea of hiring someone to work in our homes, scouring our sinks, hoovering our dust bunnies, and mopping our floors. In the US, mention that you've hired a maid, and eyebrows are raised. Add that he or she lives in, and thoughts - many of them not at all flattering - are thunk. Which is probably why I've only rarely referred to Wan in this blog. Culture is an inescapable influence. Wan joined our household nearly five years ago, when we moved to Bangkok, but I'm still American enough to be a little embarassed by the fact that we have a maid (which is how Wan refers to herself, eschewing the politically correct term 'domestic helper'). 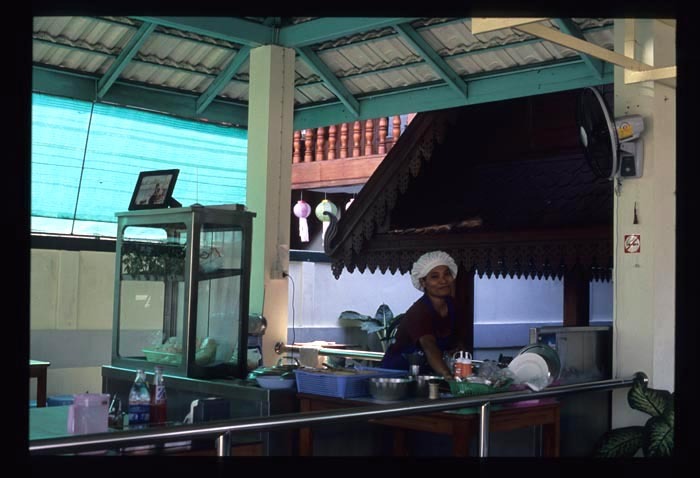 Yet over the years, in addition to cleaning our house and providing love and care to our menagerie when we travel, Wan has been a fount of rural Thai kitchen wisdom. I write about food. This is a food blog. And it's time I shared her knowledge with EatingAsia readers. 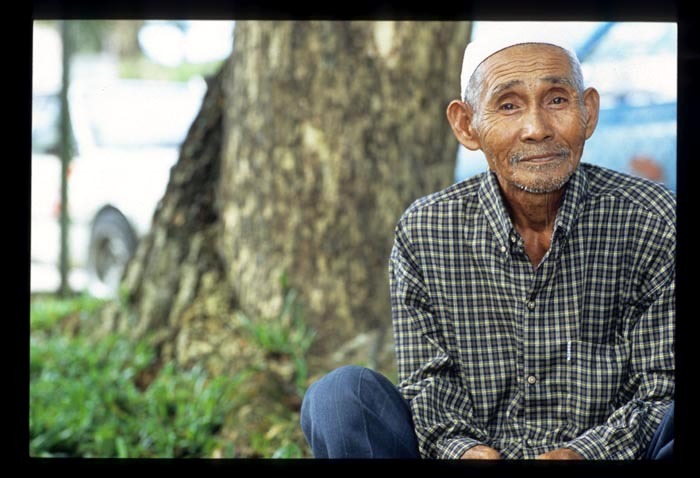 Like most maids and taxi drivers in Bangkok, Wan is from Isaan, Thailand's poor northeast region. 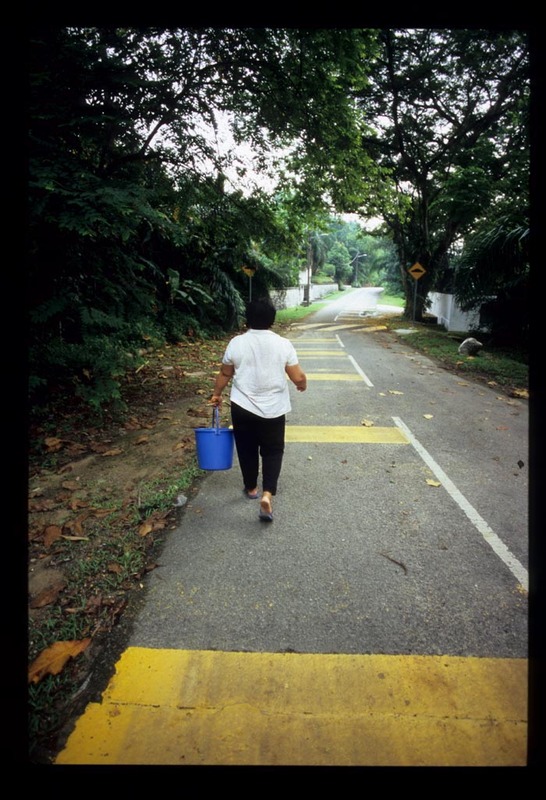 She grew up with a brother and two sisters in a small village an hour from the nearest provincial town and headed to Bangkok to look for work when she was in her early twenties. 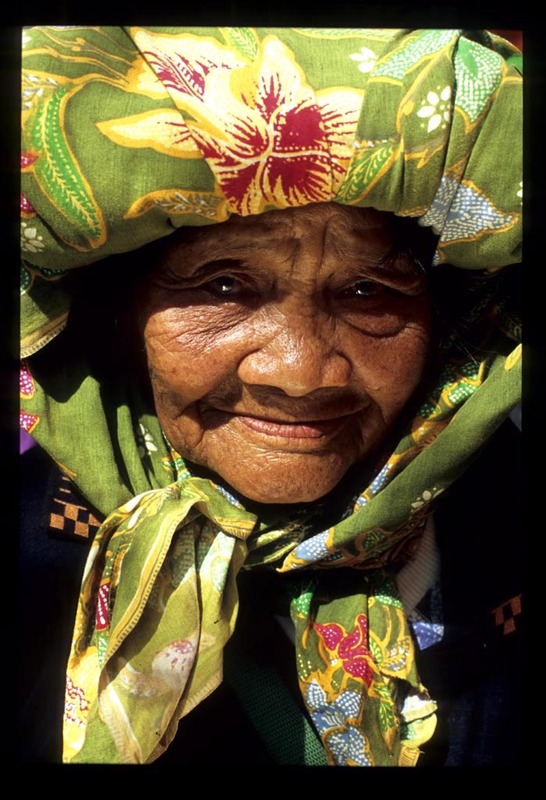 She was 41 when she took her first plane trip (when we left Bangkok for Saigon) but now, an experienced traveler and overseas resident, she's a celebrity in her home village. Despite only 4 years of formal education (average, for Thai rural dwellers) she speaks good English, the product of classes in Saigon and careful attention to the Discovery Channel, HBO, and food magazines. Wan is friendly and good-natured. She loves to joke, and easily parries Dave's sarcasm with her own witicisms. She's curious about everything, especially food - she'll try anything, from osso bucco to ma la dofu, that I whip up in the kitchen. And though she'll vehemently deny it, she's a gifted, instinctual cook, of the sort of simple, earthy dishes that don't often appear on Thai restaurant menus. Dishes like kai mot phat, stir-fried ant eggs. I've little interest in the 'weirdnesses', the oddities, of Asian cuisines. We're sport eaters, not adventure eaters, and don't seek out balut, dog, or waterbugs so that we can say, 'I've eaten it.' 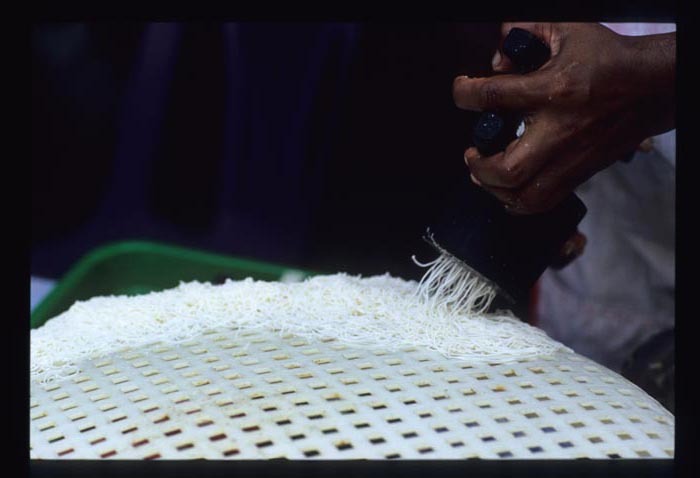 Dave and I sampled ant eggs at a Laotian restaurant in Bangkok years ago. They were served in a greasy omelette and did not impress. They weren't disgusting, just ... nothing, not worth the calories. We didn't seek them out again. But when Wan ventured out a couple of weeks ago with a bucket and returned home an hour later with a few handfuls of ant eggs and a big grin on her face, I reconsidered. Wan's like us - she lives for deliciousness. In Bangkok she introduced us to gaeng ki lek, bplaa raa, khae flowers in sour curry and spicy salads, and wild Isaan mushrooms. I trust her palate. We asked to observe the next harvest and taste the results. The eggs eaten in Thailand (and here in Kuala Lumpur, at least in our house) come from an ant that nests in trees, rather than in the ground. 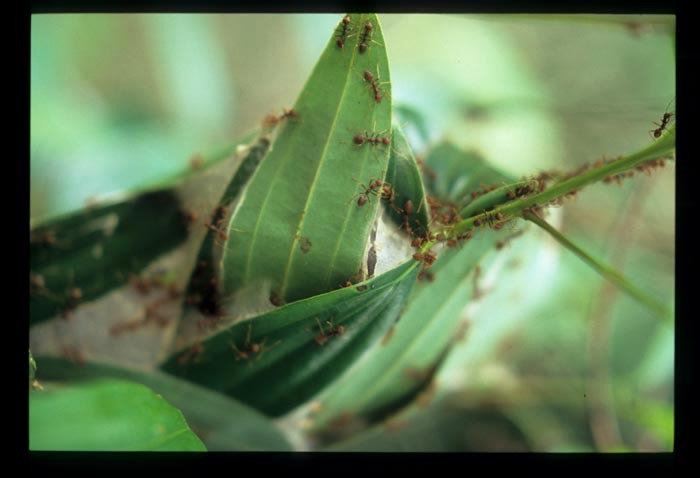 Weaver ants (kerengga in bahasa Malaysia) are medium-sized red ants that deliver a formidable bite laden with stinging formic acid. 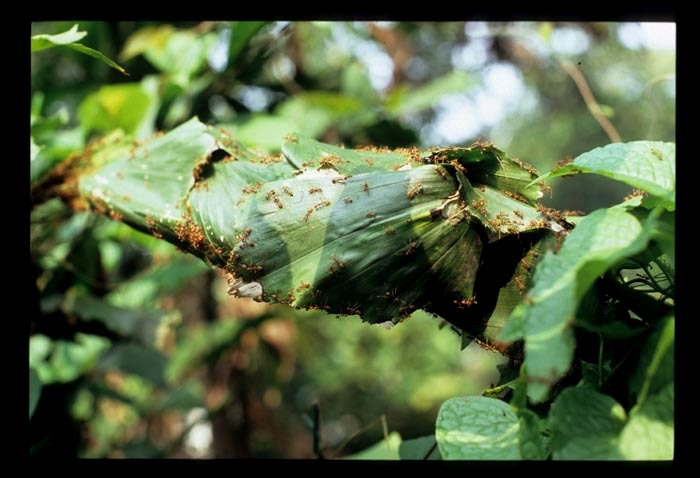 They're so named for their nests, among the most complex in the ant world, which hide in leaves folded and stuck together with sticky 'silk' squeezed out of larvae by worker ants. When Wan takes a walk in the neighborhood she scans the roadside foliage for plump leafy 'tubes' swarming with red ants (two photos up), and then confirms the presence of eggs by 'cracking' the nest (above). Harvesting is accomplished with a few simple tools: scissors, a stick, and a bucket filled to less than an eighth with water. 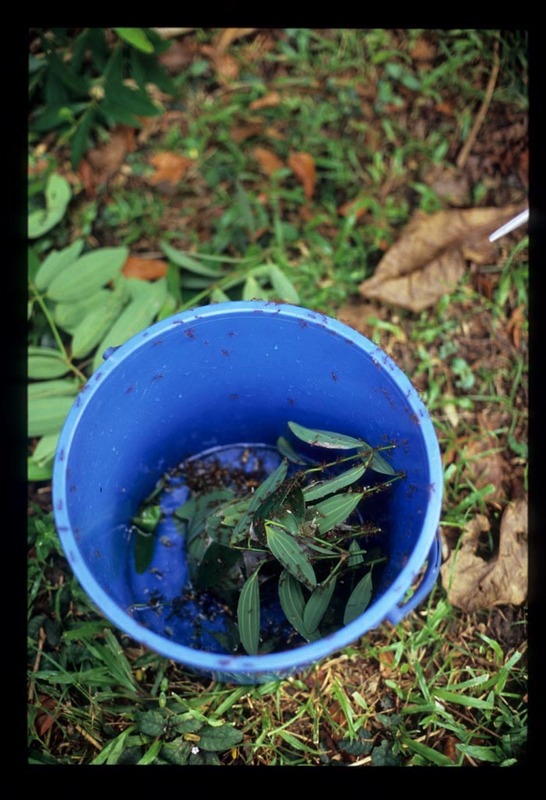 Moving quickly - disturbed ants are angry ants, and angry ants are biting ants - Wan cuts the nest from its branch and drops it into the bucket. 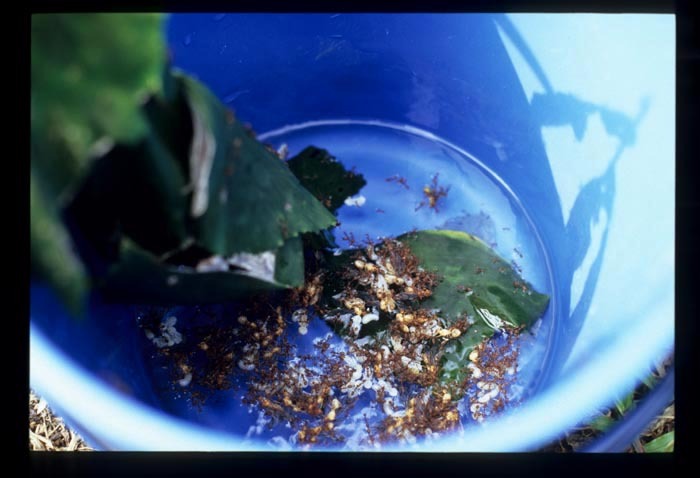 Then she reaches into the bucket and, after pulling out and discarding loose leaves, shakes the nest at its base to release the eggs. 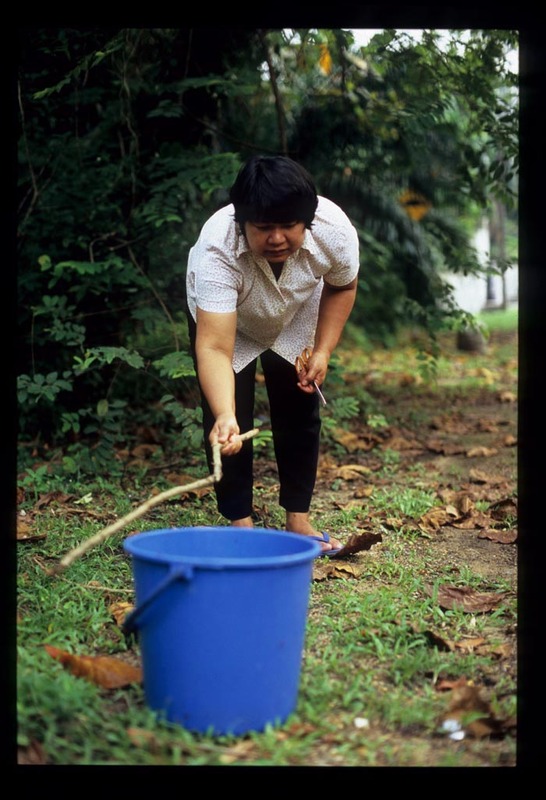 Beating the bucket with a stick saves her hands from bites and plunges ants swarming the inside of the bucket into the water, where they'll die. Back home, Wan picks through the eggs, discarding some - but not all - of the ants. 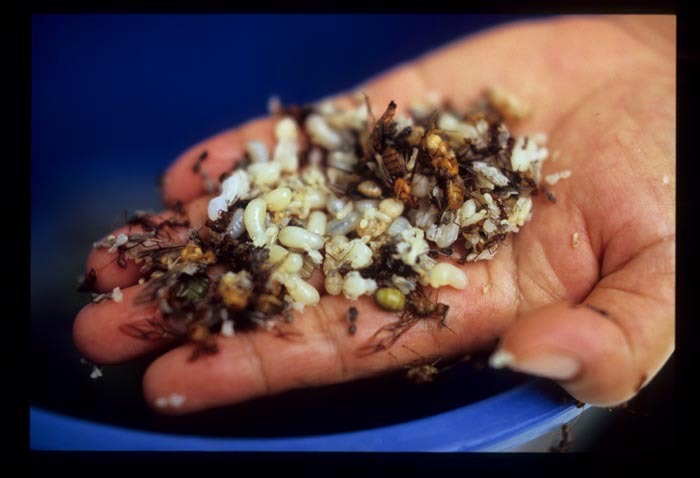 Fastidious cooks won't include any ants in their ant egg dishes, but Wan likes the crunch and flavor the insects add. 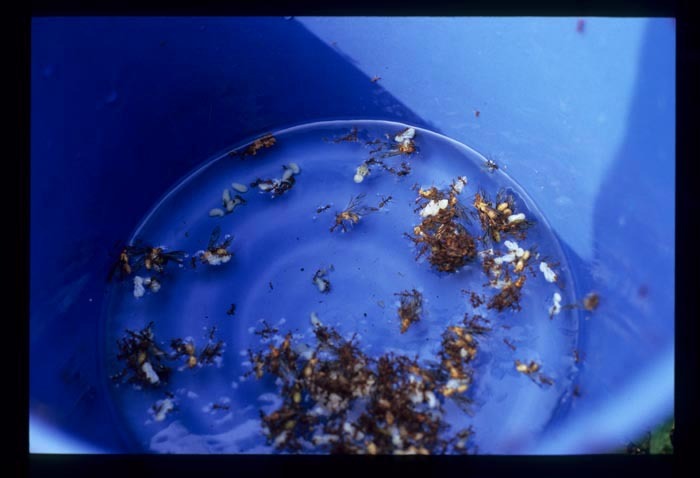 She leaves ants and eggs to float in water until an hour or two before she intends to cook them, when she drains them in a colander. Later that day Wan stir-fries heaps of chopped garlic, fresh red chilies, and lemongrass over high heat for a minute or two, then tosses in sliced scallions, along with the eggs and ants. After four or five minutes over the fire they're ready to eat, but not before receiving a splash of fish sauce and a shower of slivered makrut (lime leaves). The aromas released from the wok during the cooking process have set my stomach rumbling, and I gladly accept a small bowl. As I bring a spoonful to my mouth, however, I find the sight of the dark ant corpses off-putting, and I have to look up or close my eyes to complete delivery of the food to my mouth. However unsettling the dish looks, it's absolutely wonderful to taste. The eggs (and, I guess, the ants) are almost mouth-puckeringly tart and stand up well to the fragrant, lightly browned garlic and the fierce heat of the chilies. 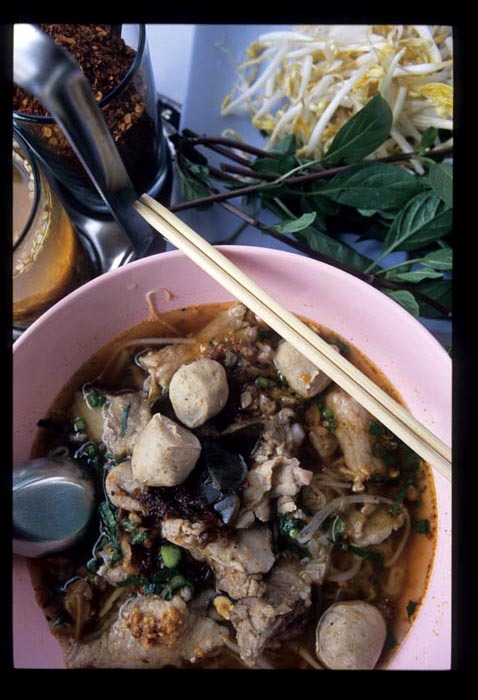 Each spoonful is an amplified example of the classic Thai flavor profile: sour, sweet, hot, salty. There's just one problem - my American-bred mind can't quite wrap itself around the fact that I'm eating insects, which is driven home everytime an ant leg gets caught on the corner of my mouth or on the roughness of my tongue. The eggs I can deal with. The bugs I can't. In the end culture wins out over appetite, and I put my bowl down half-finished. If I'm ever to eat ant eggs again, they'll have to be pristine, free of dead bodies. Wan says the ingredients of this dish should be entirely liao de rot khon - according to one's taste. An Isaan girl through and through, she likes her food hotter than hell; adjust the amount of chiles accordingly. Ant eggs are available, canned, at some Thai grocery stores in the United States. If you live in southeast Asia you can harvest your own. 1. Heat a wok or frying pan over high heat, add the oil, and swirl it over the surface of the pan. Add garlic, chilies, and lemongrass, and stir-fry for a minute or two, just until the garlic starts to brown. 2. Add ant eggs and green onions and stir-fry 4 or 5 minutes. Add the fish sauce and the lime leaf slivers, give the dish a final stir over high heat, and scoop the lot into a bowl. Serve immediately, with rice.